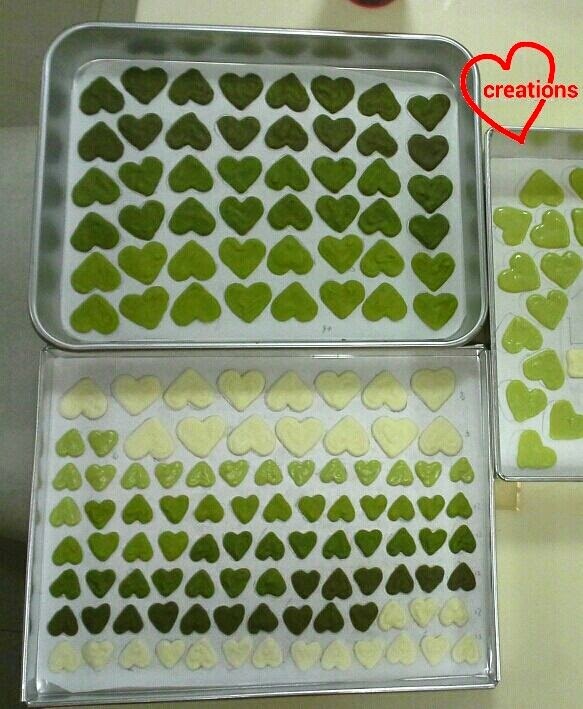 When my friend knew that I was baking for other people, she wanted a bake from me too, especially after seeing my post on the Ombre Matcha White Chocolate Hearts. So I decided to use up my remaining ingredients from the weekend bake to make a cake for her, with lots of Matcha white choc thrown in. 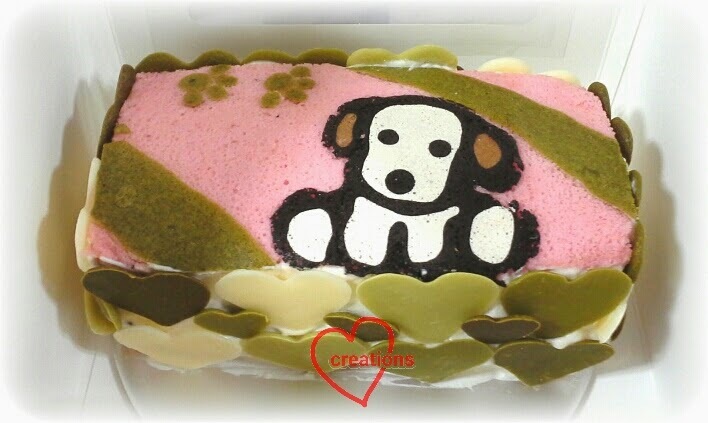 She likes dogs and has an absolutely cute one at home so I made a doggie cake for her :). 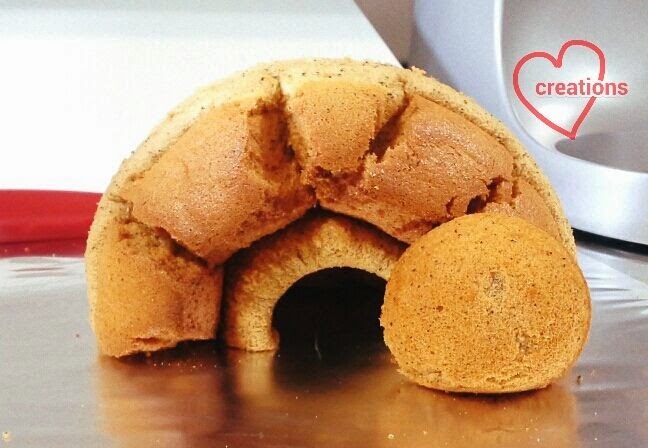 This cake is the result of a failed swiss roll. Can you believe it? 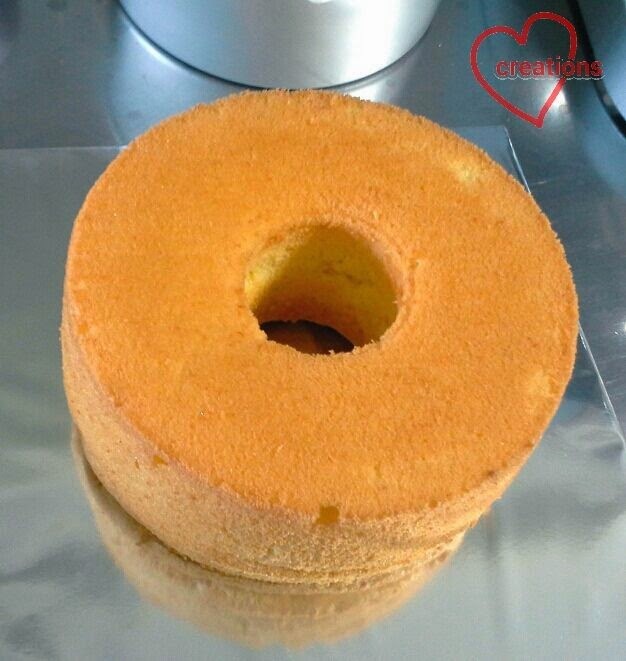 It is the first time I baked a really thick layer cake and wondered if it could be rolled. Now I know I better not try :p. The cake cracked despite my efforts to make slits on the cake surface to aid with the rolling. All my chiffon layer cakes have been very bendy and thin so far. I guess we learn best from our mistakes. A valuable lesson I learnt about how to salvage a cracked swiss roll too :). I adapted my recipe from Ochikeron. That could also be partly why the swiss roll cracked as I did some major substitution to incorporate red bean flavor in the cake. I should have stuck with my regular Azuki chiffon recipe that has always been very bendy despite sitting out for a long time. 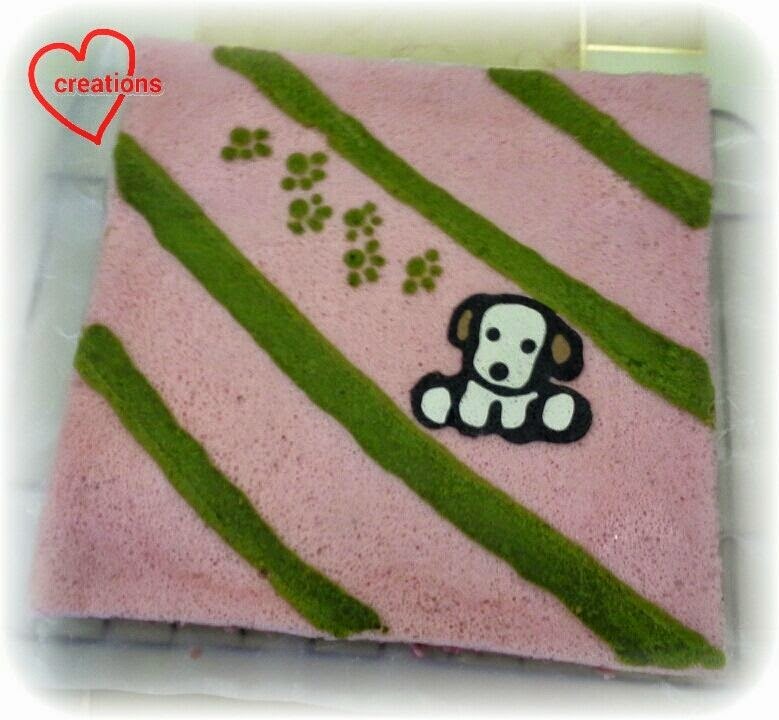 Nevertheless, the cake texture is still very nice, soft and wonderful as a layered cake. 1. Cut silicone baking sheet to fit pan size (10 x 10") and place stencil under baking sheet. I find that using silicone baking sheet results in a smoother surfaced cake. Paper baking sheets tend to leave wrinkles on the surface of the cake. 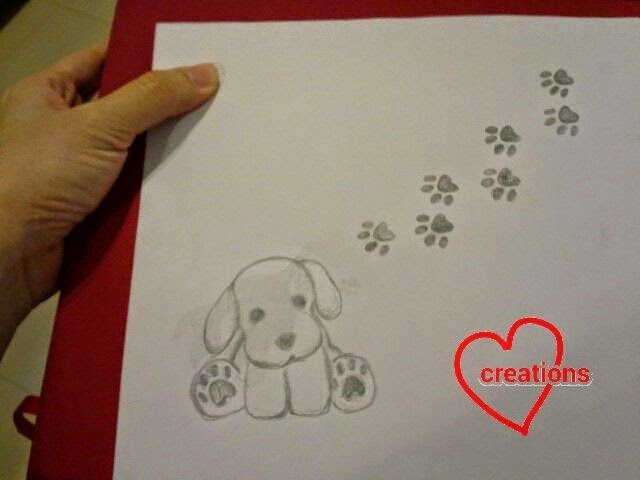 I drew my own stencil as pictures of doggies online are not as cute as the stuffed toy we have at home ;). 2. Grease the silicone baking sheet with oil so that the patterns don't stick to the sheet. Preheat the oven to 170 degrees Celsius. 3. Prepare the egg yolk batter. Use an electric mixer to beat egg yolk, sugar, 20ml of oil until white. Add water, red bean paste, 25ml of oil and vanilla essence and mix well. Sift in flour and baking powder and mix well. 5. Start with the black outline of the doggie and bake for 30 seconds. 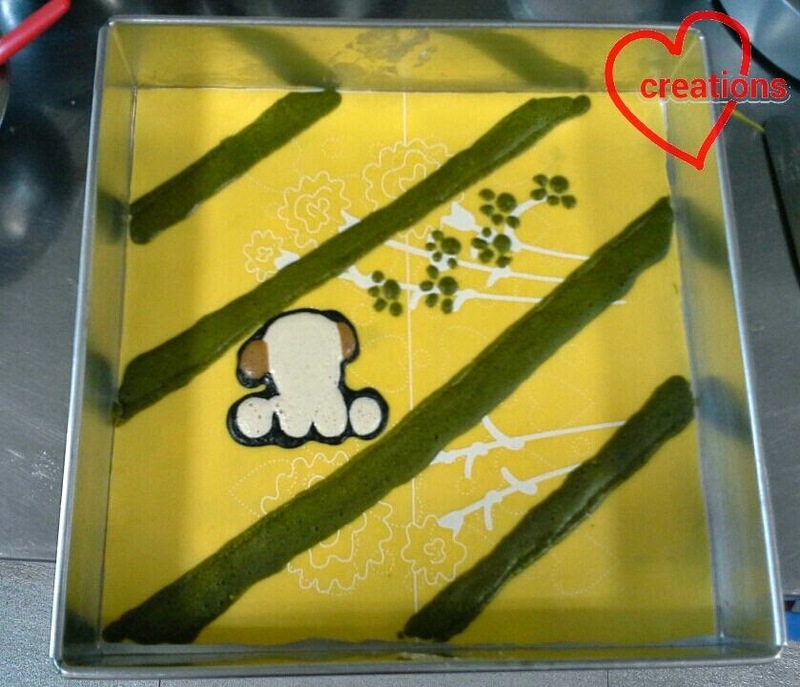 pipe in the white body, brown ears, green footprints and stripes and bake for another 1.5 minutes. Bake for 30 seconds more if the batter is still not dry. 6. Add a few drops of liquid red food coloring into the egg yolk batter and mix well. 7. Prepare the meringue for the main batter following the steps in 4. Fold in 1/3 of the meringue into the egg yolk batter and mix well. Quickly but gently fold in the rest of the meringue in two batches. Slowly pour the batter into the pan and drop the pan a few times on the table top to release any trapped air bubbles. 8. Bake for 14 minutes. Cut around the pan sides, cover with baking sheet and flip the tray upside down. Leave the cake on wire rack to cool with another sheet covering it. So glad that the patterns came out beautifully! My cake turned out rather thick possibly because I used really large eggs. 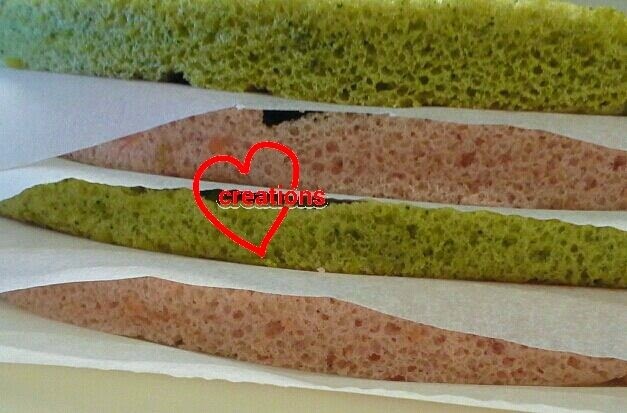 If you are making it swiss roll style, prepare the syrup (sugar, hot water and matcha powder) and brush it on the surface of the cake before filling with cream and rolling it. 9. Prepare the red bean cream by whipping cold whipping cream with electric mixer until it thickens. Add sugar and whip until firm peaks form. Fold in some Azuki bean paste (I used about 4-5 tbs. You may add more or less according to your taste) a bit at a time. 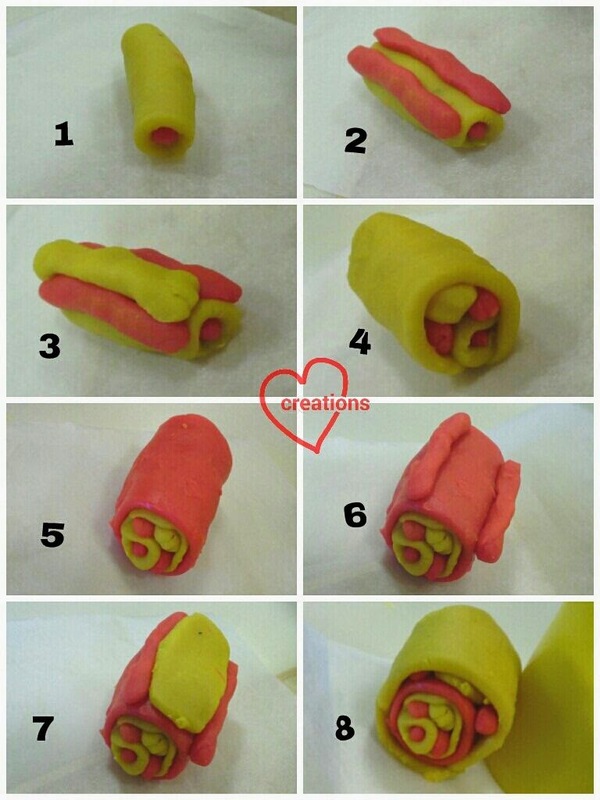 For the swiss roll I just lined the cream with red bean paste instead of folding it in. After the roll cracked, I just mixed the bean paste into the cream and added to the layered cake. 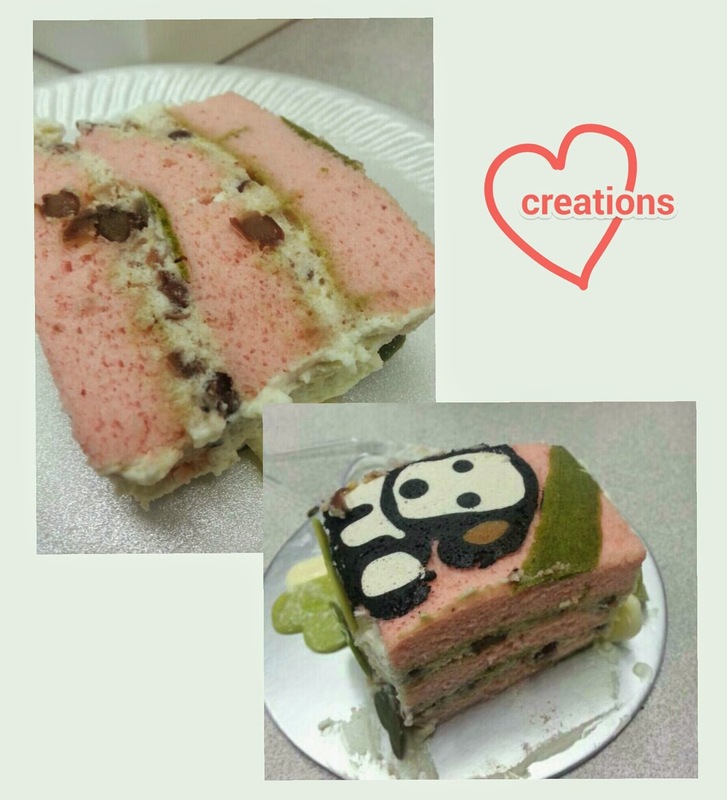 I salvaged whatever I could of my cracked swiss roll and made it into a 3-layered red bean cream cake with cream and matcha white chocolate hearts decorating the sides of the cake. So relieved that I could still give something presentable to my friend :P.
My friend and her colleagues loved the cake, especially the red bean and green tea chocolates combination. The cake was not too sweet and the sponge was nice and fluffy :). She has kindly taken some photos of the cut-up cake for me. 1. Preheat oven to 150oC. Prepare a tray of water at the bottom of the oven (I used the lowest rack to bake the cake). 2. Whisk egg yolks, whole egg, corn oil, orange juice and salt until well combined. 3. Sift in flour and stir till smooth batter formed. 4. Aliquot out 6 tsp of batter for patterning and divide batter into 3. To 2 of the portions, add charcoal powder till desired colour and a tiny dip of wilton pink coloring for the pink batter. Add 1/3 tsp cake flour to each batter and mix well. 5. Beat egg whites and cream of tartar until foamy using an electric whisk. Add in sugar in 2 additions and beat until firm peaks are formed (or just reach stiff peaks). The peak formed doesn't flop over but it's not overly stiff either. Scoop over meringue over into patterning batter (2 tbsp per 1 tsp batter) and fold gently. 6. Fold in the rest of the meringue into the rest of the batter gently in 2 additions. 7. Pipe the black and pink batter onto the bowl and tray (for the eyes and ear) and bake for 1.5 min, then pipe the plain batter (for the mouth patch) and bake for 1 min. *Steps 5-7 must work very quickly. If take long to pipe, then best to make meringue with 1 egg white first specially for piping. After that then make meringue for the main cake batter. 8. Pour the cake batter into the glass bowl till 2/3 full and the rest into the tray. Bang the bowls/tray on the counter top 3 times each side to get rid of big air bubbles. 9. Steam bake at 150oC for 40 min or when skewer comes out clean. 10. Remove from oven and invert immediately on cooling rack. 11. Unmould gently with hand and peel off baking sheet when the cakes have cooled completely. 12. Cut out and shape the ears using a combination of cookie cutters and knife carving. “Glue” the parts onto the cake using melted white chocolate. 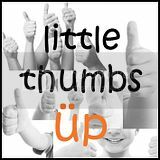 This post is linked to the event, Little Thumbs up organised by Bake For Happy Kids, and My Little Favourite DIY, hosted by Ann of Anncoo Journal. 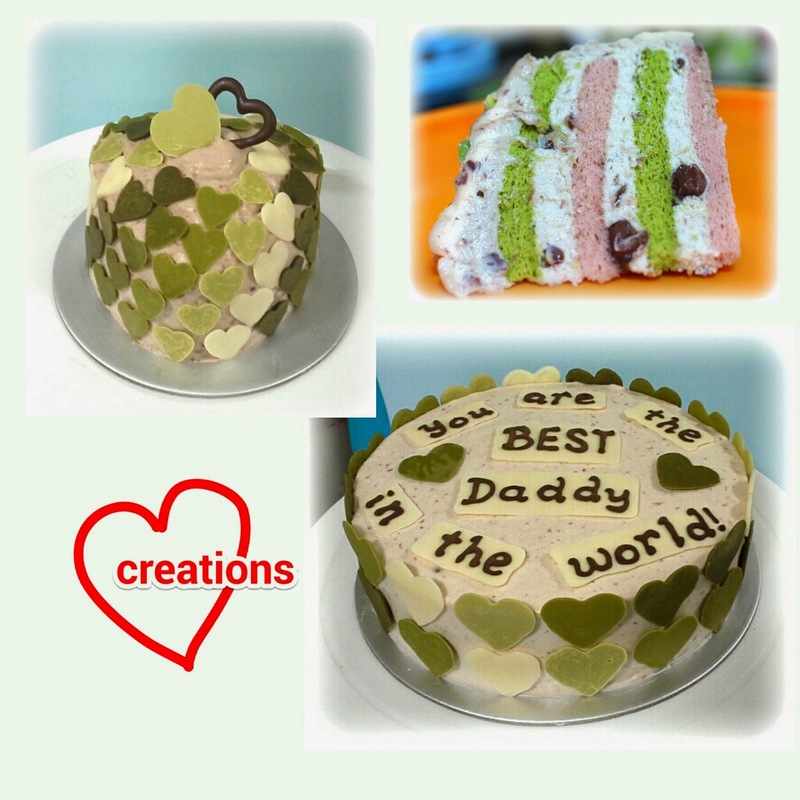 My neighbor loved my Matcha Azuki layered cake with Azuki cream so much that she wanted this flavor for her hubby's birthday! 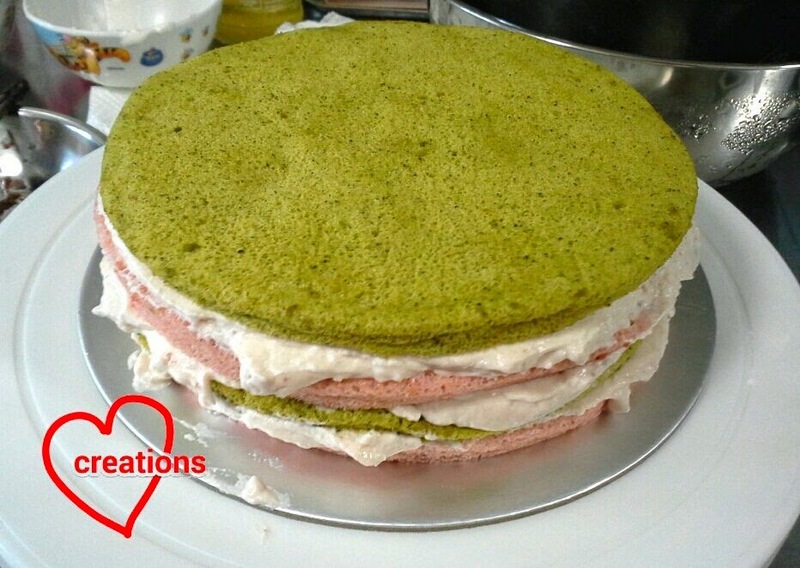 So I made this cake with more red bean cream as requested by her and made some green tea white chocolate hearts for decorating the cake, ombre style. A friend knew of it and would like me to make a small cake with the same flavor for her wedding anniversary. I ended up making two cakes for the weekend! My friend has kindly helped to take a nice photo of a slice of the cake. As I am a newbie at frosting whole cakes and cake decorating, I decided to go for a simple but sweet design, therefore the ombre green tea hearts...just in case my frosting was uneven :p. I didn't dare to pipe the requested birthday message on the cake directly too just in case I make mistakes. I piped the message using dark compound chocolate on white chocolate base. 1. Place all ingredients in (A) in a small bowl and melt the chocolate using double boiling method. Keep stiring until all the chocolate is melted and the matcha powder is well incorporated. 2. Transfer the melted chocolate into a piping bag with a small round tip (I used ziplock bag fitted with wilton #3 tip) and pipe the hearts onto a tray lined with baking sheet. You may print a template or trace heart shaped cookie cutters onto paper to create the template, and place it under the baking sheet. 3. Repeat the steps with the rest of the shades of green. Allow the chocolates to dry completely before attempting to remove from the baking sheet. Store in airtight container in a cool dry place (not in the fridge) until you are ready to assemble the cake. I didn't use up all the hearts for the cakes but I prefer to err on the side of having too much than too little. 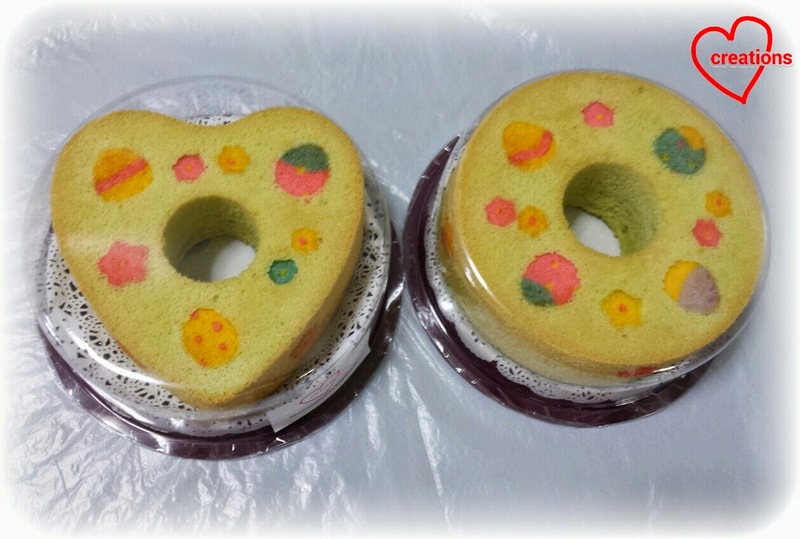 I made a 7" round cake and a 4" heart shaped cake, with 2 layers of Matcha and 2 layers of Azuki flavored cakes for each cake. I adapted the cake recipe from my previous bake with slightly more egg whites added. 1. Preheat oven to 160 degrees C. Line the tins with baking sheet. I used two 7" round tins and two smaller tins (6" or less) for each flavor. This recipe can also be used for one 10 x 10" tray. 2. Prepare egg yolk batter by first whisking sugar and egg yolk together, followed by oil, water (and bean paste for Azuki flavor) and vanilla essence. 3. Add in sifted flour bit by bit (Matcha powder as well for the Matcha flavor). Continue whisking until no trace of flour is seen. 4. Add red coloring until desired shade is reached for Azuki batter. 5. Prepare meringue by beating egg whites with cream of tartar until soft peaks are formed. Gradually add sugar until stiff peaks are formed. 6. Add 1/3 of meringue into egg yolk batter and mix well. Gently but quickly fold in rest of meringue in 2 batches. 8. Bake for 15-16min. Leave to cool completely with a baking sheet over the cake. Prepare each flavor of batter at separate times such that it goes straight into the oven after folding in the meringue so as not to deflate the egg whites. 10. Prepare the red bean cream. Sprinkle 1 tsp of gelatin over 1 tbs of cool water and let it stand for a couple of minutes until the gelatin has absorbed the water. Heat for 20-30 seconds in microwave oven on medium high-high heat until gelatin dissolves. Take 1.5 tbs of whipping cream and warm it up in the microwave oven. Add the warm cream into the gelatin mixture, stir until well combined and set aside. 11. Use an electric mixer to whip cold whipping cream with icing sugar until firm peaks form. Be careful not to over-beat the cream or it will separate.Gradually add in the gelatin mixture and whip until well combined. Fold in the sieved red bean paste one tablespoon at a time until well combined. 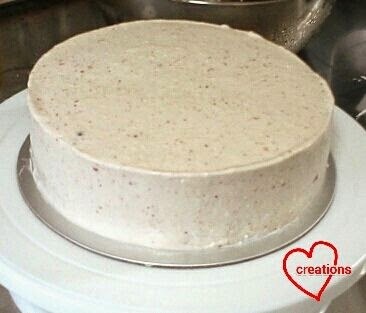 Chill the cream in the fridge for another 5-10 minutes if it is too soft and runny before frosting the cake. 12. 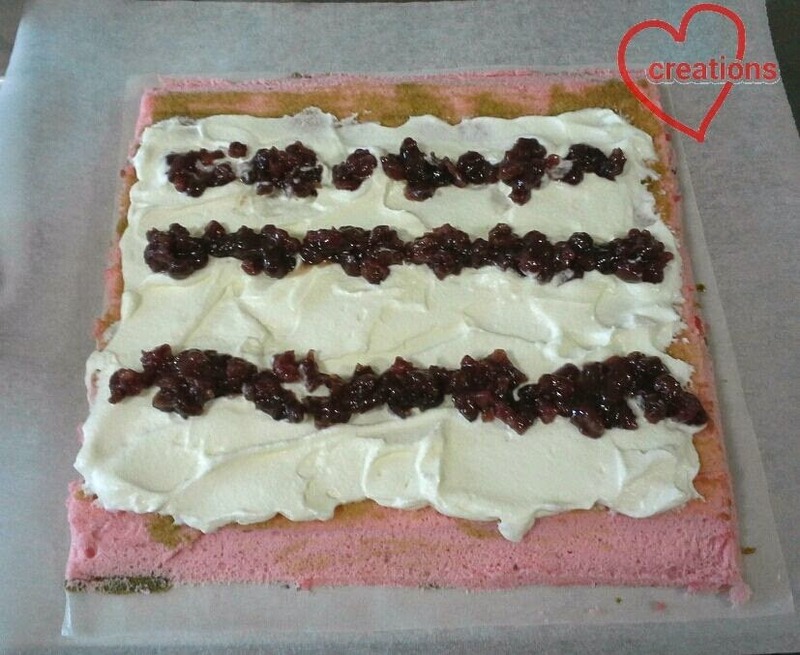 Assemble the cake by placing a layer of Azuki cake on a cake board placed on a turntable. Apply a layer of red bean cream and sprinkle one (or two for large cake) tablespoon of red bean paste on top of the cream. 13. Place a Matcha cake on top and press down gently but firmly and let the cream bleed out from the sides. Repeat step 12 with alternating cake flavors. 14. 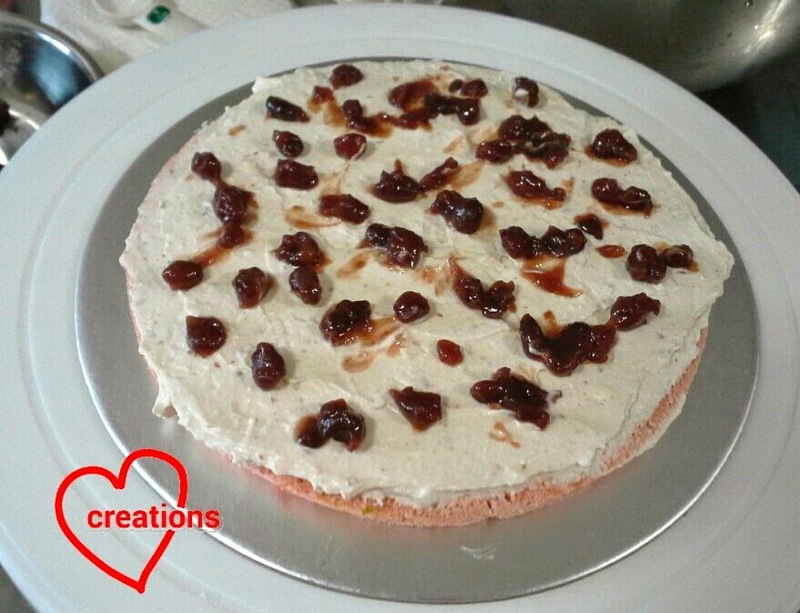 Pour red bean cream on top of the assembled cake and use a large offset or straight edged spatula to spread the cream. This was really challenging for a first-timer like me! I had to place the cake and bowl of cream back in the fridge again for 10 minutes before reworking to make the surface of the cake as smooth as possible. 16. Continue decorating till your heart's content :). I made the small cake before the large one and tried to use partially unsieved red bean paste in the cream. That's why the cakes look a little different. 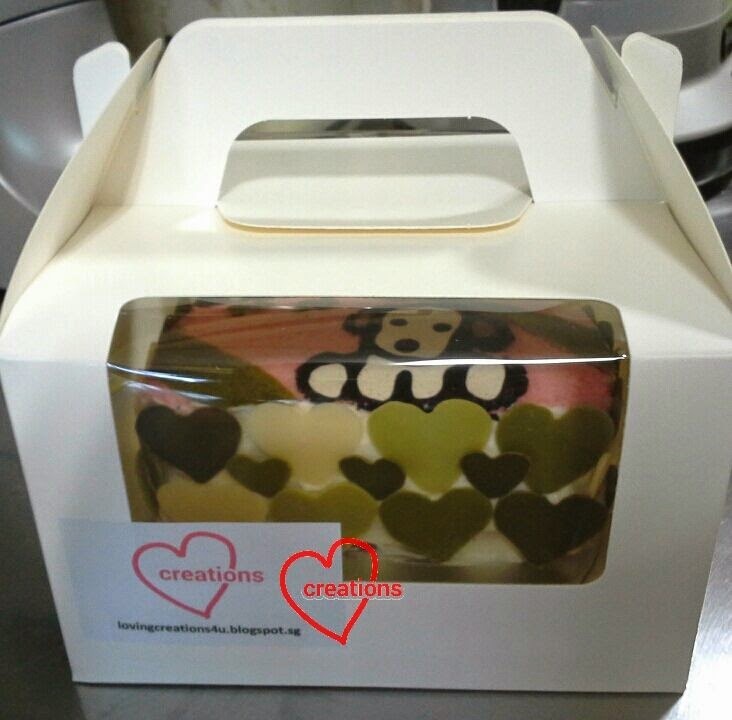 It's always so exciting to pack a finished product in a cake box with our logo :P.
The cakes were well received despite my amateur attempt! Feedback was cake texture is really nice and soft and overall very yummy :). My friend is considering recommending to her friends if I can handle it! Really encouraged to continue trying. 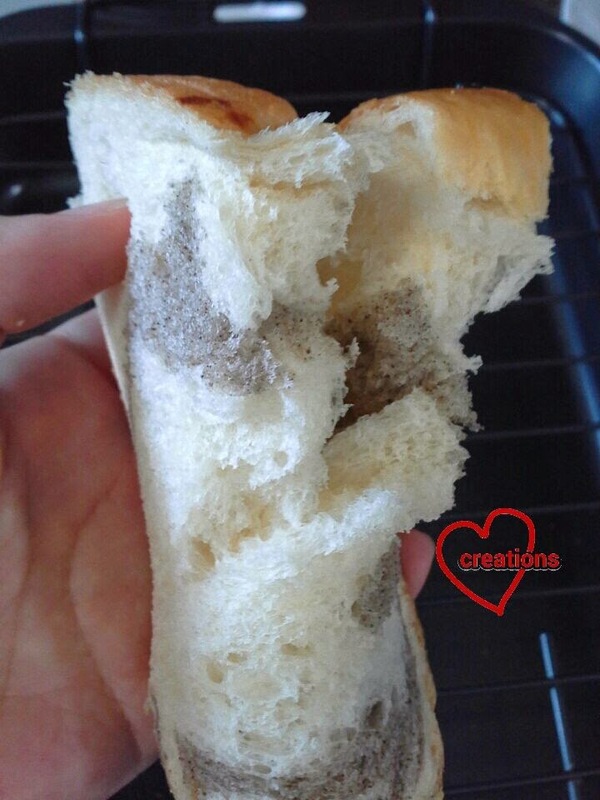 A bread that only takes 40 mins from start to your mouth! How good is that! This 40 min bread has been going around the circles in culinary kitchenette after domestic goddess wannabe shared this lovely recipe and I had to try! Verdict: it does make bread that is really soft and keeps soft next day! Her blog is a must-read for it's excellent troubleshooting guide and tips. 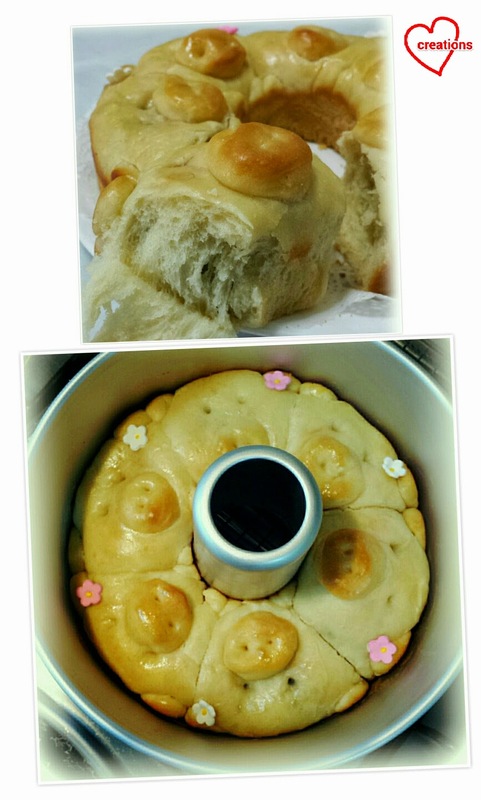 I adapted the recipe to make 6 azuki buns, my family's favourite, and piggy buns, requested by my daughter ^_^. 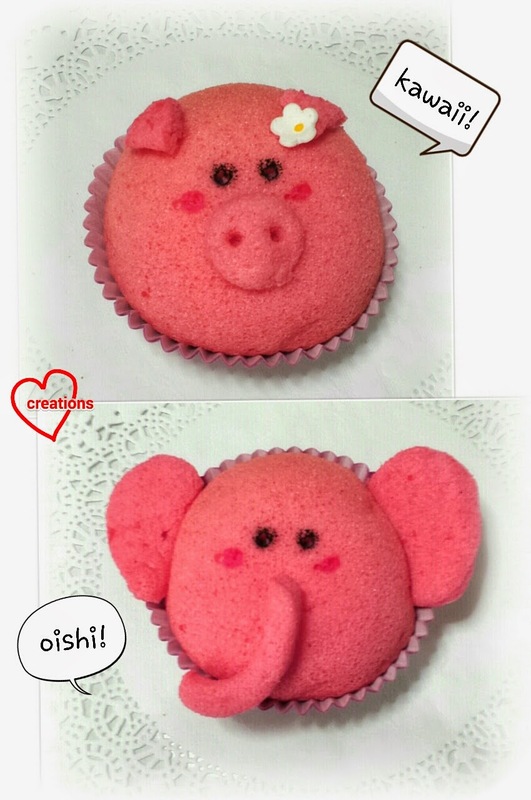 This recipe includes a quick shaping tutorial using cutters for piggies with azuki filling to shape the buns in just 10 mins (inspired by a friend's piggy buns). 1. Preheat oven to 220oC. 2. In your mixer bowl, combine the water, oil, yeast and sugar (top left) and allow it to rest for 15 minutes to let the yeast come to life (top right). During this time, I divided the azuki paste into 40g balls. 3. Add in salt, egg and flour (bottom left). Using your dough hook, mix and knead until will incorporated (bottom right) and dough is soft and smooth (less than 5 minutes). 4. Oil your hands and work surface so that the dough doesn't stick to them. Shape dough into 6 piggies balls with azuki paste (10 min). - Roll dough into 2-3mm thick sheet. - Use a cup (I used McDonald's cola cup) to make 6 big circles for dough and 3 cm round cutter to make 11 small circles. - For the noses, make 2 small holes using toothpick in 6 of the small circles. - For the ears, cut 3 of the small circles into quarters (each quarter is a ear). - For the tiny feet, cut 2 of the small circles into quarters, then further divide each quarter into 2 to make a feet. - Place each azuki ball into the big circles, seal and pinch tight, and place in a greased 17 cm chiffon tin with its pinched side facing down. - Stick on the noses, ears and feet. - Use a toothpick to carve out piggy eyes on the buns. 5. Allow to rest for 10 minutes. Glaze lightly with egg wash.
My animal ogura cupcakes are having a silly conversation! :p Aren't they kawaii? ^_^ I made them for a dear friend's son who loves cute animals. His favourite was elephant so here is my attempt though I'm not too good with it. She liked pink so strawberry flavour was the natural choice (natural food colouring :)). The recipe was adapted from both my Froggy Pandan Ogura Cakes and Hundred Eighty Degrees strawberry ogura as I didn't have strawberry powder. 2. Whisk egg yolks, whole egg, corn oil, milk, puree, strawberry essence and salt until well combined. 4. Aliquot out 4 tsp of batter for patterning and divide batter into 2. Add charcoal powder till desired colour and a tiny dip of wilton pink coloring for the pink batter. Add 1/3 tsp cake flour to the batter and mix well. 7. Pipe the black and pink batter onto the bowls and bake for 1.5 min. 8. Pour the cake batter into the glass bowls till 2/3 full and the rest into the square tray. Bang the bowls/tray on the counter top 3 times each side to get rid of big air bubbles. 12. The nose and ears were carved out using a combination of cookie cutters and knife carving. I used my hearts cutter to cut out a “J” for the elephant’s nose. 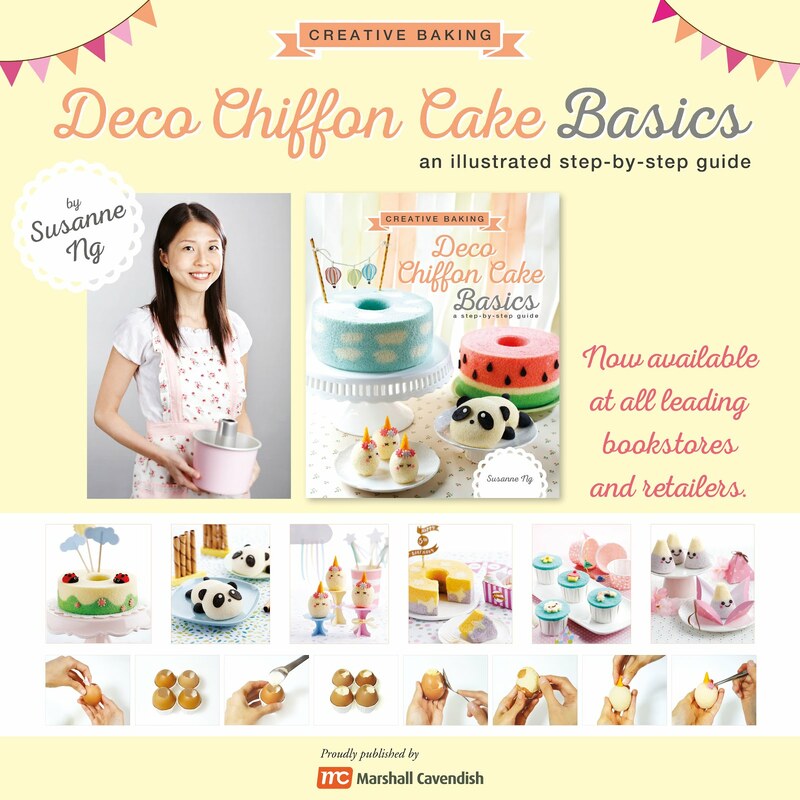 The picture tutorial for the piggy nose and ears are found in my post on Pig pig rockmelon chiffon. “Glue” the parts onto the animal cupcakes using melted white chocolate with marshmallows. 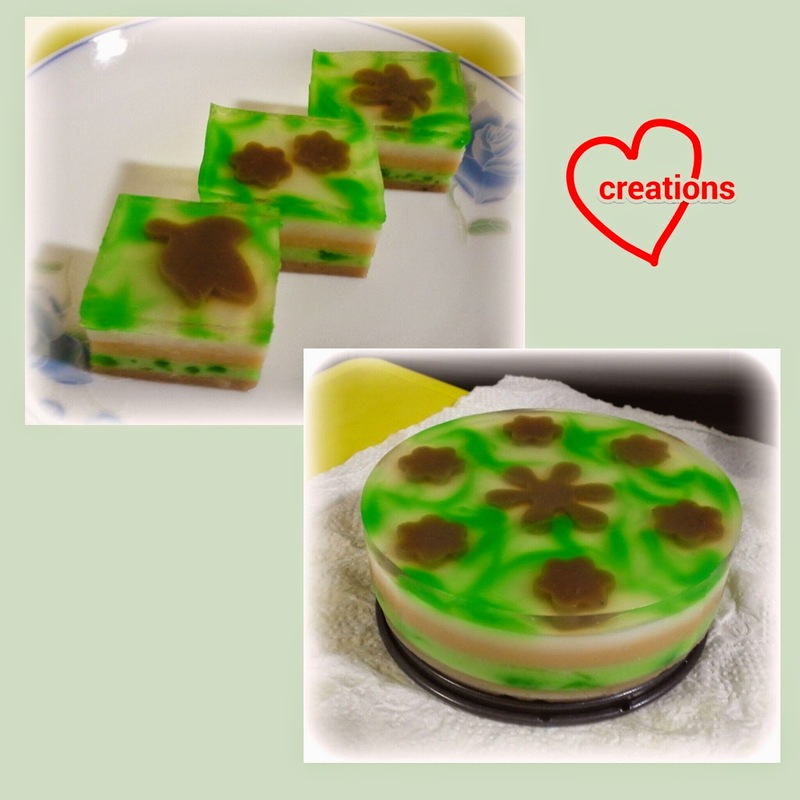 My hubby who isn't a fan of cakes in general loves chendol so I decided to make a jelly "cake" for his birthday some time last year. Yes, this is an old "bake" but Susanne thinks this is too pretty to keep it to myself :p. This post shows my second attempt, which is an improved version of my first. I tried to incorporate all the components of chendol goodness... sweet red beans, chendol jelly, gula melaka, fragrant pandan, rich coconut milk flavors, all into each bite :). I made the round jelly in a 4" springform pan and the small slices in a loaf pan. 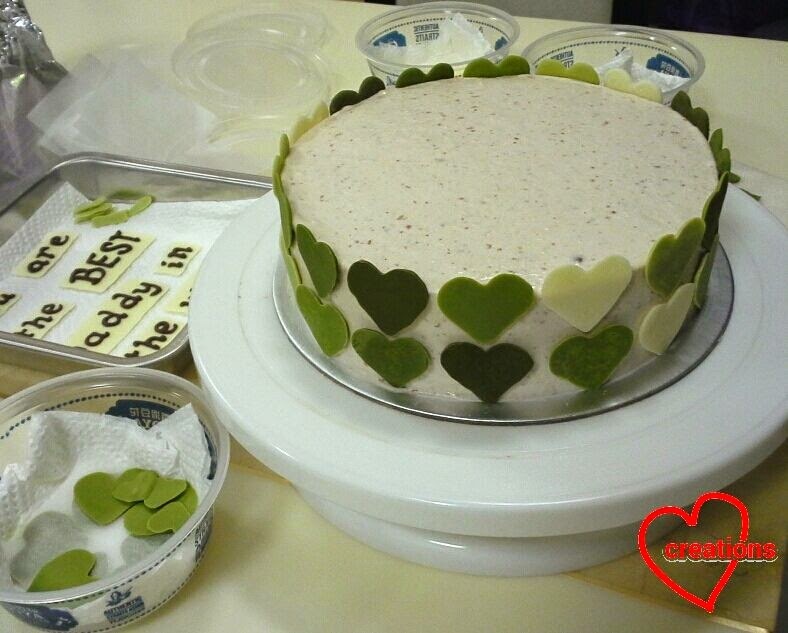 The agar cake is made up of 5 layers. Beginning from the top: clear agar with chendol and red bean jelly designs, caster sugar layer, gula melaka layer, chendol layer and finally, red bean layer. All layers contain coconut milk except for the top layer. Making this is really simple as it does not require any skill (you just need to know how to boil water) but requires patience because you have to wait for each layer to set before pouring the next. The whole process took about 2-3 hours. To begin, boil some water with pandan leaves for a few minutes to make pandan flavored water. I usually don't count exactly how many leaves. About 1.5L of water and a few leaves cut to 2-3cm strips should suffice. You may vary the amount of sugar and gula melaka used, depending on how sweet you want the dessert to be. 1. Prepare the red bean jelly decorations. Boil all the ingredients in a small saucepan until sugar and agar powder dissolves. Pour into loaf pan and let it cool. Use cookie cutters to cut out shapes and set aside. 2. Prepare red bean layer. Boil all the ingredients and pour into loaf pan/ springform pan/ mould (if you happen to use). Refrigerate until set. When the layer has set, use a fork to scratch the surface. This is to help the layer on top anchor to the bottom layer. Proceed with the next three layers (chendol, white caster sugar and brown gula melaka) in the same way. 3. Prepare the clear jelly by boiling the pandan water, sugar and agar powder. 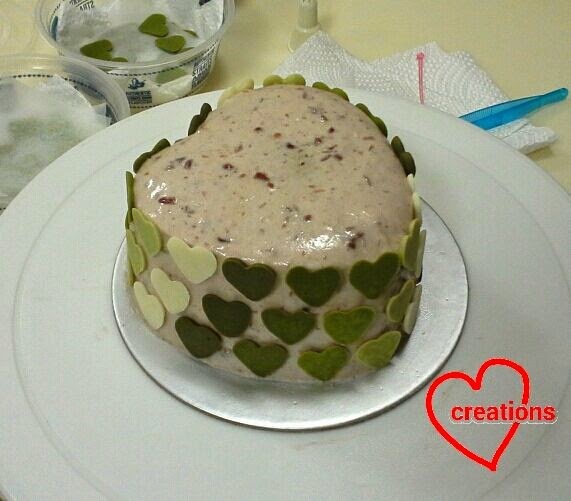 Line the red bean decorations on top of the white layer and carefully pour the clear jelly over. Add some chendol jelly into the clear jelly layer. We had enough to share with our neighbors and they loved it too :). A dear friend of mine wanted to give her kids a nice school treat when she was going to do craft with them, so she asked me to bake something related. 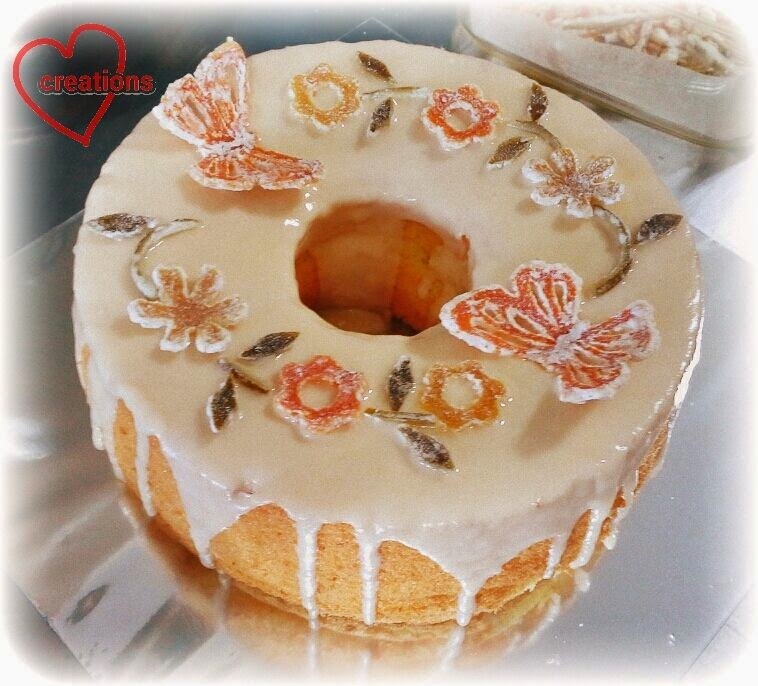 I decided to do a fun "hidden eggs in the garden" theme to delight the kids with hidden eggs in the chiffon cake. 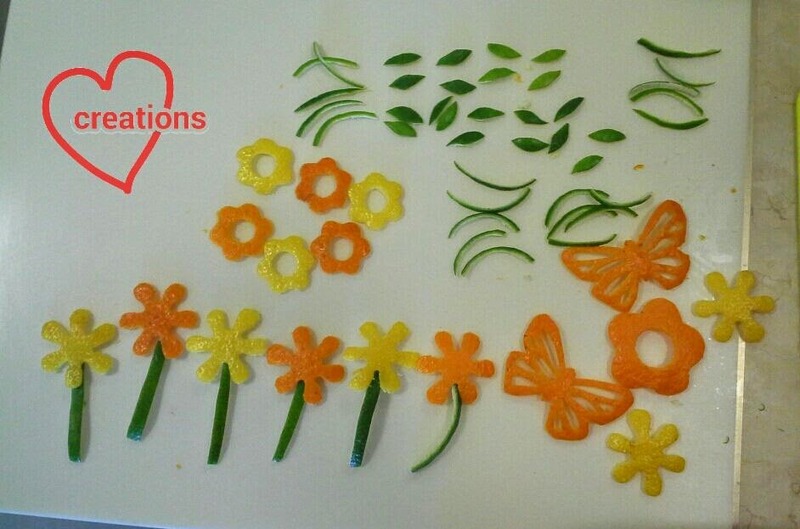 Flower designs in the pandan chiffon would be used to represent the garden. These cakes took me about 2 days to finish. Using the vanilla layer cake recipe from my earlier post Hidden Rainbow Strawberry Chiffon for Baby Shower, I baked 4 trays of 10"x10" layer cakes with piped or layering designs of different colours. 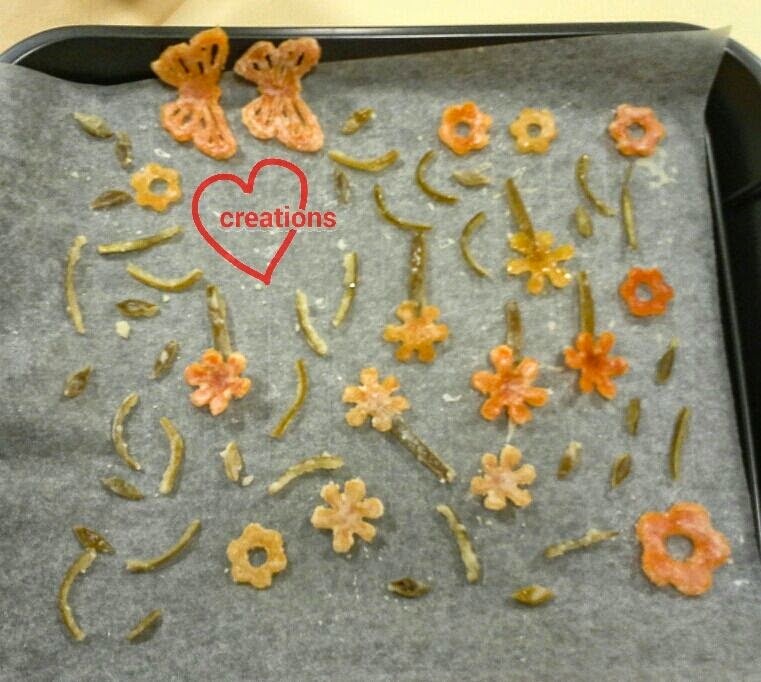 After that, I used egg-shaped and flower cookie cutters to cut out "eggs" and "flowers" for the cake (picture below). 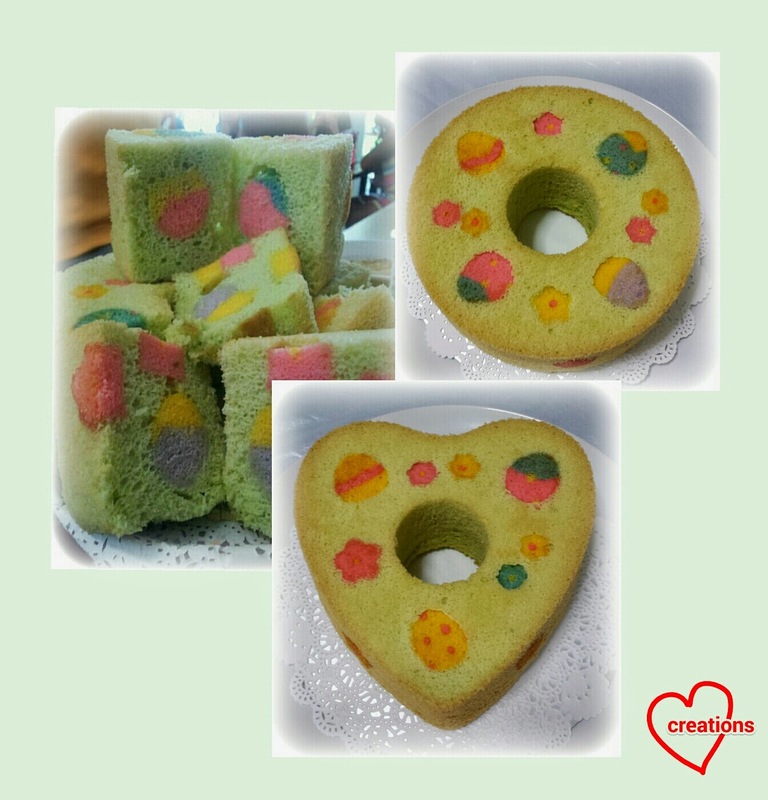 These "eggs" and "flowers" were then baked into the pandan chiffon cake using the same method as my previous post Valentine's Day Hearts-in-all-directions Strawberry Chiffon Cake. Before I baked my pandan chiffon, I did quite a bit of research into what makes a good pandan chiffon and finally decided on a recipe that incorporated ssb baker's (less cake flour - for moisture and softness), ellena guan's (more egg whites - for softness) and ieatishootipost's (salt and vanilla essence - for the extra flavour). I made sure to use fresh coconut milk and homemade pandan juice and paste from pandan leaves. I was pretty pleased with the soft. fragrant end result, so I thought I'll share the recipe :). 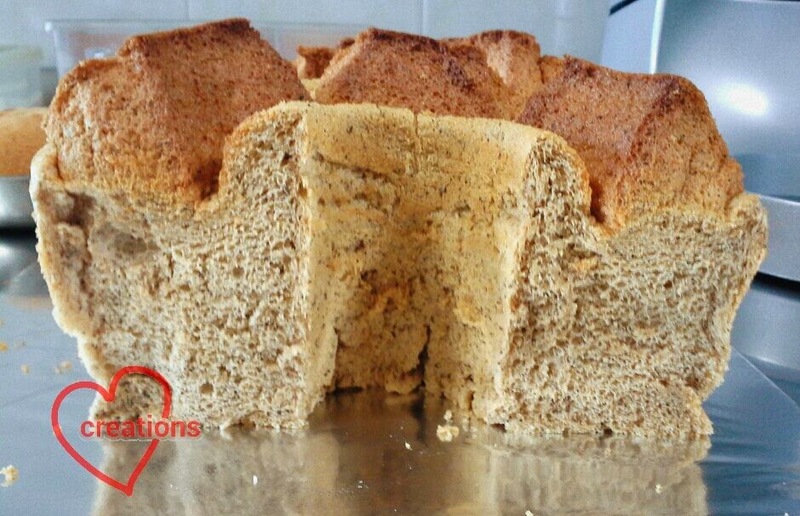 Below is the recipe for plain pandan chiffon cake without patterns and hidden designs. 1. Prepare fresh pandan juice by blending fresh pandan leaves (10 leaves cut into small pieces, omitting the tips) with 50 ml water. Strain with a sieve and press out all the liquid with a spoon. 2. Preheat oven at 160°C. 3. Beat egg yolks with sugar with whisk till pale yellow before stirring in oil, coconut milk and pandan juice. Add pandan paste and vanilla extract. Mix well. 5. Meringue: Beat the egg whites with ¼ tsp cream of tartar till stiff peak, mixing in caster sugar in 2 additions. 6. Fold in the meringue gently into the batter 1/3 at a time. 7. Pour the batter into the chiffon tin from a height. 9. 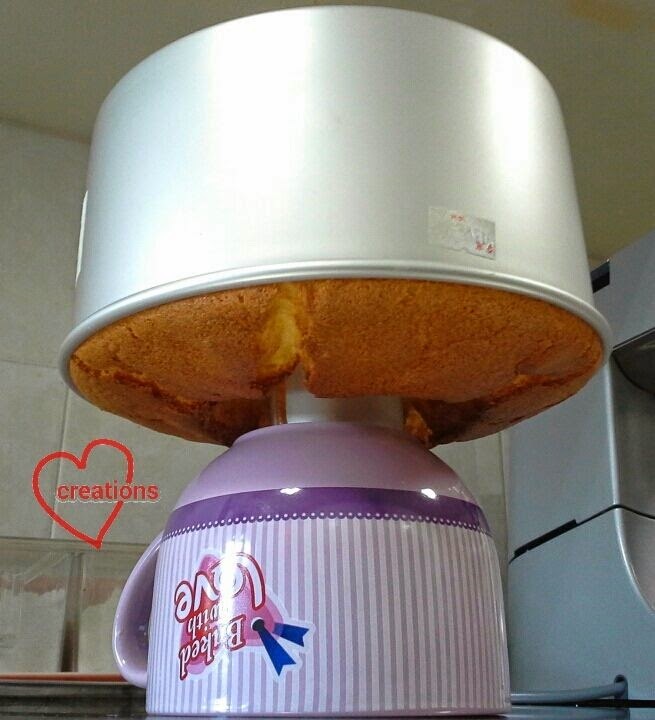 Bake the cake for 15 min at 160°C then 35 min at 150°C. 11. Unmould after the cake is cool. I had fun dressing up the cakes in my new boxes! 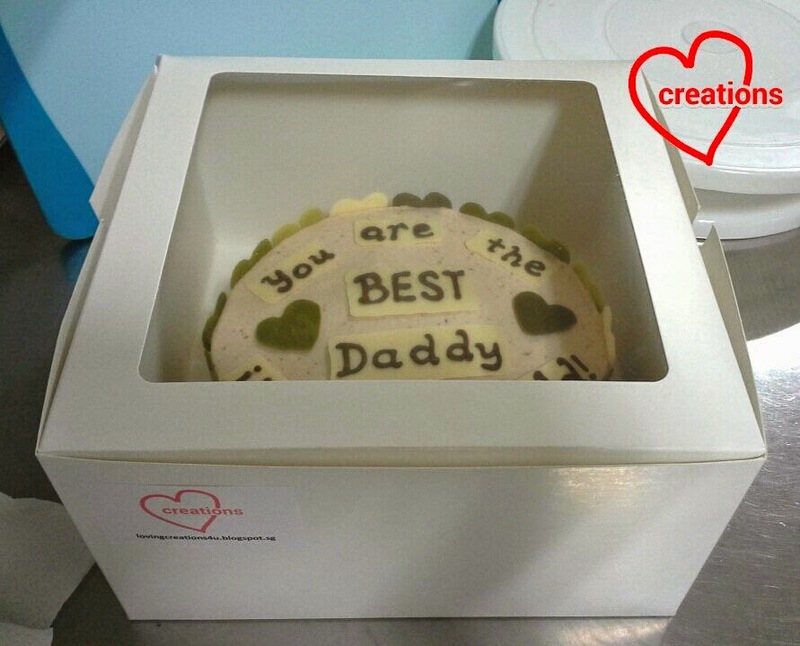 I was a little nervous on how the cakes would be received but thank God my friend said that the kids were delighted! She was also really encouraging and generous. I was also really happy that I managed to pack enough "eggs" to appear in every slice of the cake. From this bake, I learnt something about the size/curvature of the hidden objects as there were some small bubbles above "eggs" in some slices, something I did not observe for the hidden hearts or rainbows. Probably next time for larger and more curved objects, I need to bang the tin more to release the bubbles. This was probably my most complex and challenging bake thus far. 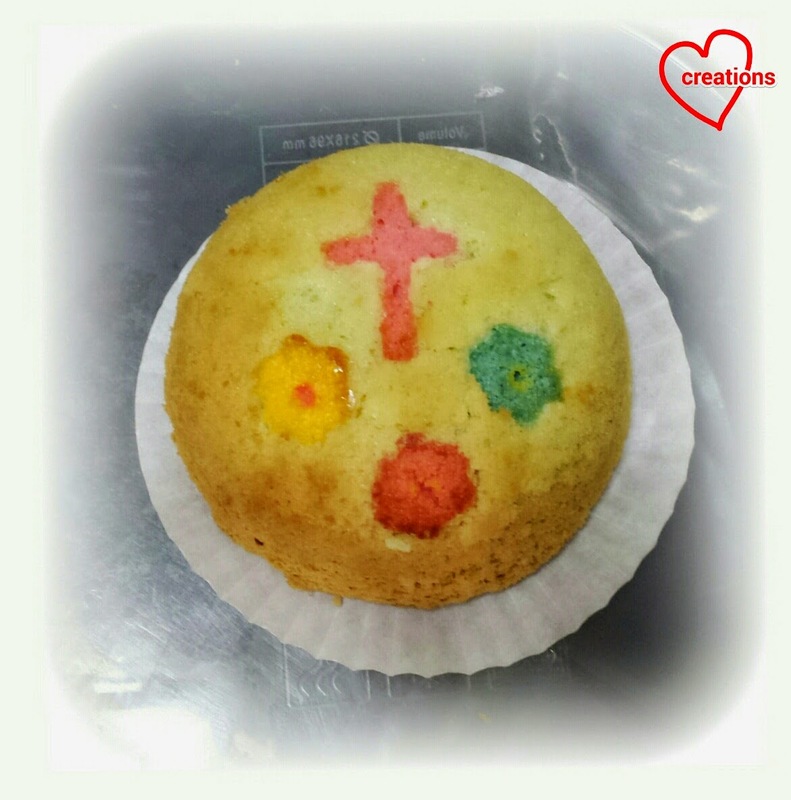 I had enough leftover batter for one small cake, shaped to look like a cross on a hill, to remind the family about God's love displayed through Jesus' death on the cross for our sins. 1 John 4:10. "This is love: not that we loved God, but that he loved us and sent his Son as an atoning sacrifice for our sins." My friend was planning a "C" themed party with a few of her colleagues and requested for a pretty cake from me! I was really excited to get started on this project and gave some thought to the design. As I am still new at baking for other people, I didn't want to do something that is too complicated but has to be special and pretty. My mandarin orange chiffon cakes have consistently been getting good reviews so I decided on mandarin orange flavor for the cake. In order to fit in with her "C" theme, I decorated the cake with candied citrus peels to add more things that start with the letter "C" into the mix :P. Here's my mandarin orange Chiffon Cake with orange frosting and Candied Citrus peel decorations! I made the citrus peel decorations almost a week ahead of time so that I don't stress myself out. I peeled a mandarin orange, a lemon and a couple of limes, removed most of the pith with a melon baller and did some Art N Craft work using cookie cutters and a small fruit carving knife. 1. Dissolve 1.25 cups of sugar in 1.5 cups of water in a small saucepan over the stove. Add the peels and simmer for about an hour without stirring. 2. Drain the peels using a sieve and dab off any excess syrup with a paper towel. 3. Dry overnight on a baking sheet. I dried the butterflies with one wing against the side of the tray so that when they dry, the butterflies won't be flat but instead have wings that are slightly lifted up. After drying the peels, I stored them in an air tight container until I was ready to assemble. I modified the recipe for mandarin orange chiffon cake to include more oil, juice, zest and flour. 1/5 tsp cream of tartar. 2. Prepare the egg yolk batter. Whisk egg yolks and sugar until it turns pale and frothy. Whisk in oil, orange zest and juice until well combined. Gradually whisk in sifted flour with baking powder until no trace of flour is seen. 3. Prepare the meringue. Use an electric mixer to beat the egg whites until frothy then add cream of tartar. Beat until soft peaks form then gradually add sugar until stiff peaks form and the mixing bowl can be over turned without the meringue falling out. 4. Fold in one third of the meringue into the egg yolk batter until no trace of egg whites can be seen. Quickly but gently fold in the rest of the meringue in two batches. Bang the mixing bowl on the table to release any trapped air. 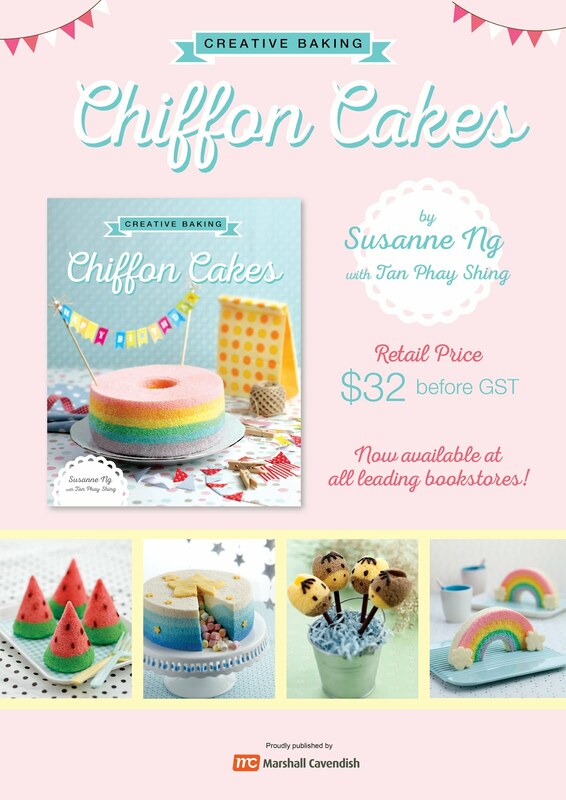 Pour the batter into a 17cm chiffon tin. 5. Bake for 15 minutes then reduce the temperature to 150 degrees Celsius and bake for another 25-30 minutes. Immediately invert to cool once out of oven. 6. 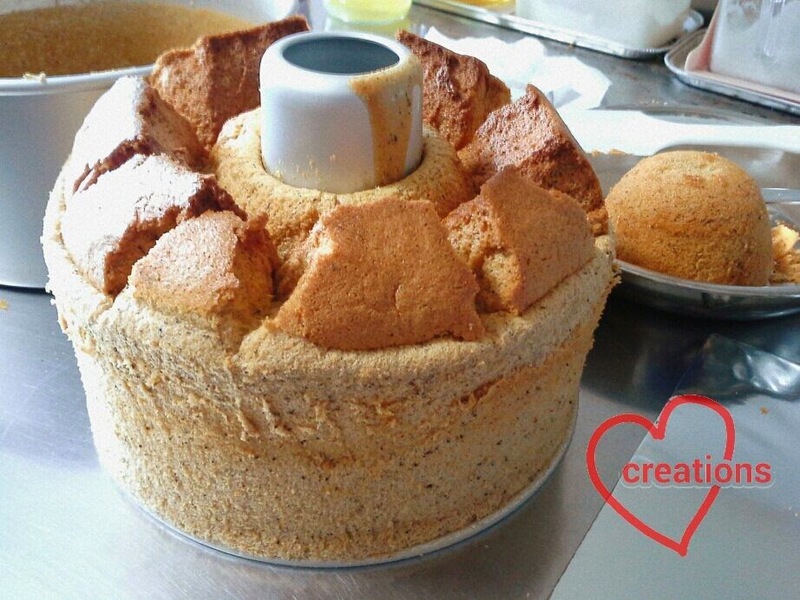 Carefully unmould the cake using a combination of hand and spatula as the cake is really soft. 7. Mix together some royal icing sugar and icing sugar, and add freshly squeezed orange juice until a desired consistency is reached. I.e. 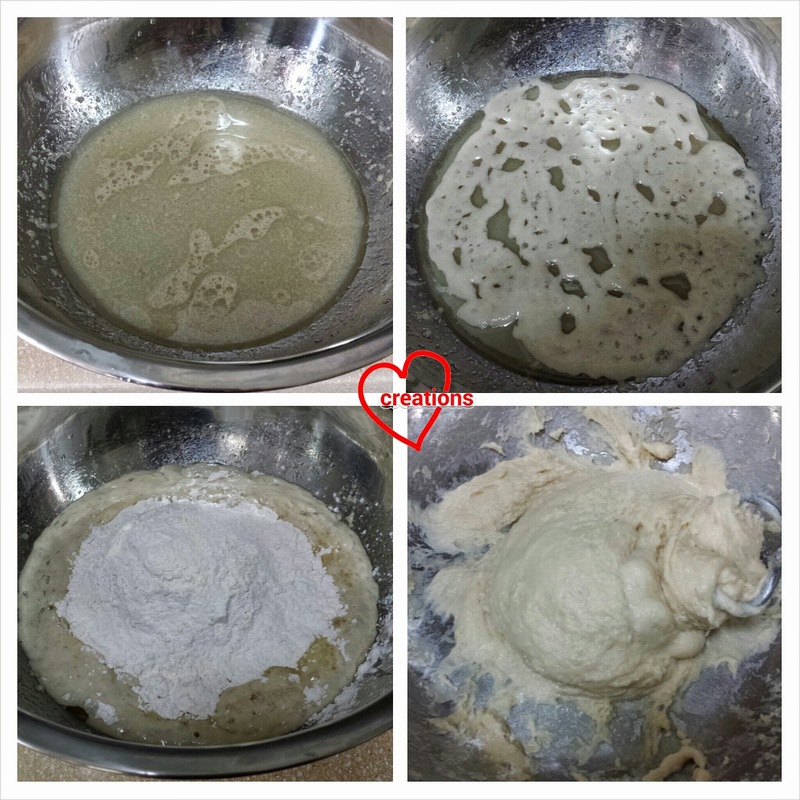 the mixture flows slowly but does not leave any peaks when you drop some drops of it into the bowl of mixture. As I was in a hurry, I did not measure the quantities of ingredients used. I prepared about 1/2-3/4 cup worth of frosting. The frosting was applied onto the cake using a spoon, letting the frosting naturally flow over the sides a little. 8. Attach the citrus peel decorations. The frosting will anchor the decorations to the cake. I was a little apprehensive about how the cake would be received but thank God that my friend said that the cake was really nice and everyone was very impressed although they would have preferred it without the frosting, what with being people above a certain age without sweet-tooth :P. The cake tasted good enough on its own. It is really soft and fluffy because of the low flour content and extra egg white, and full of orange flavor as I have been generous with the amount of orange juice and zest. This is such good news! We celebrate Easter because Jesus was raised from the dead and had conquered death. 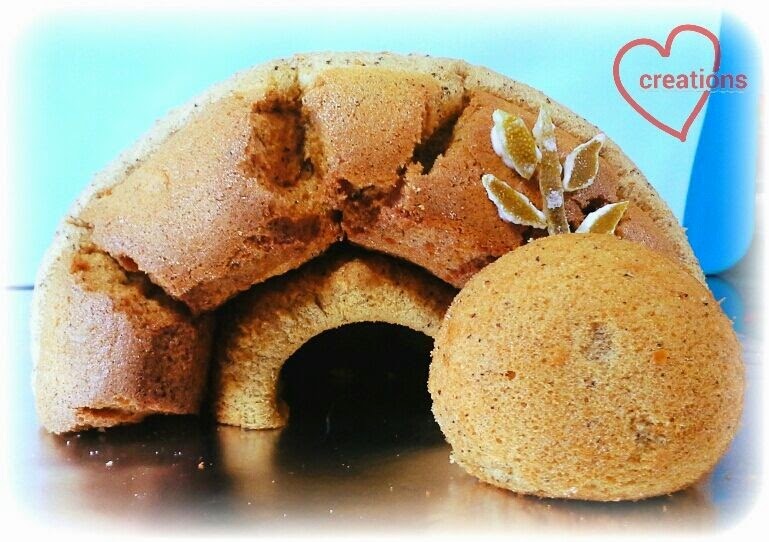 I made a simple earl grey ogura cake in the shape of the empty tomb to share with the kids this good news :). 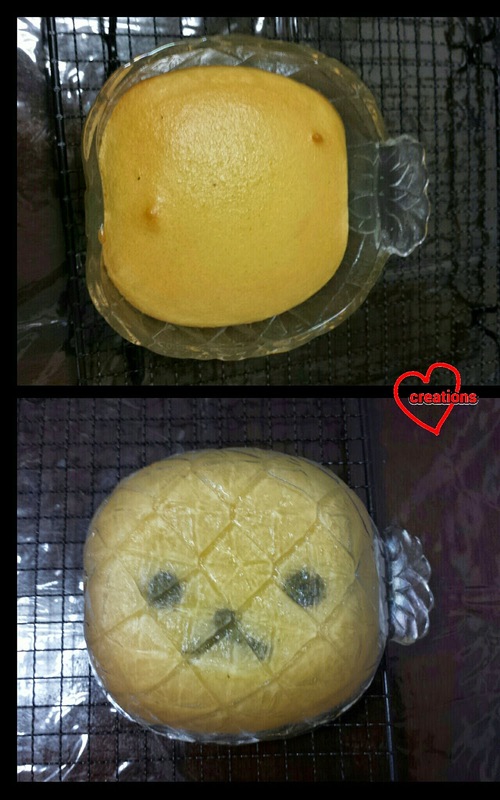 You may scratch your head and say "Is this really ogura cake? It does not look like one!". I agree! It was an experiment I had with baking ogura cake in a chiffon tin (people don't usually do that and I wanted to find out why). And through some unintended "mistakes" and "divine intervention", the cake ended up looking more tomb-like than I envisioned... LOL! I placed the tin on a rack that was probably too high and I whipped the meringue to stiff peaks this time (but not very ramrod stiff). The cake ended up looking like a very "huat" chiffon cake but the texture and softness is unmistakably ogura. It's so soft that the cake can't hold its own weight well! I adapted the recipe from Ann Low's orange ogura cake. I used a 17cm chiffon tin and a small round bottomed glass bowl to bake the cakes. 1. Heat the milk and tea leaves until warm (not boiling) and let the tea leaves steep in the milk. Set aside and cool. 2. Preheat the oven to 160 degrees Celsius with a tray of hot water at the bottom rack. Set the rack for the cakes at the second lowest position. I placed mine at the middle. That was probably too high. 3. Whisk egg yolks, egg and oil until frothy. Whisk in tea with milk. Gradually add in sifted flour and whisk until no trace of flour is seen. 4. Beat the egg whites until frothy. Add cream of tartar and beat until soft peaks form. Gradually add in sugar and beat until firm peaks form. I beat until stiff peaks form, which explains why the cake did not collapse even though it has very low flour content but cracked like nobody's business at the top. 5. Add one third of the meringue into the egg yolk batter and mix well. Fold in the rest of the meringue in two separate batches quickly but gently. You may find the hand folding method more helpful when folding in the meringue for ogura cakes as the egg yolk batter is more runny than chiffon batter. 6. Spoon 3-4 tbs of batter into the small glass bowl and slowly pour the rest of the batter into the chiffon tin. Bang the chiffon tin on the table a few times to release any trapped air. Put them in the oven and reduce the temperature to 150 degrees Celsius. Bake for 45-50 minutes. Invert to cool. 7. 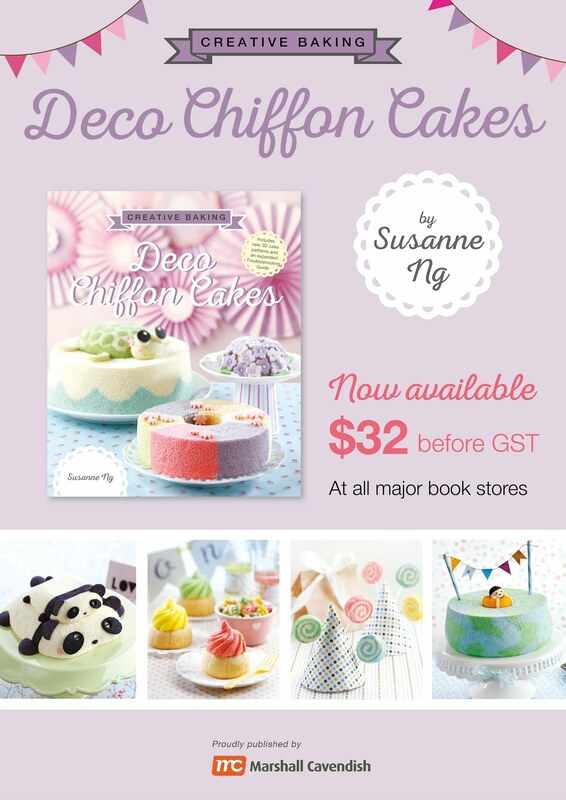 Carefully unmould the cake from chiffon tin using a combination of hand and spatula. Unmould the small cupcake using a metal teaspoon. 8. Cut the big cake into half. You can see it buckling a bit under its own weight because it's really soft. 9. Arrange one half of the big cake and the small cupcake as shown in the photo to form the empty tomb. You may have to cut the cupcake a bit if it is too big to fit the tomb opening. I also had to stuff a bit of cake into the hole of the "tomb" to support its weight as the arch was threatening to collapse. 10. I attached some candied lime peel to form the vine on the tomb using royal icing sugar. 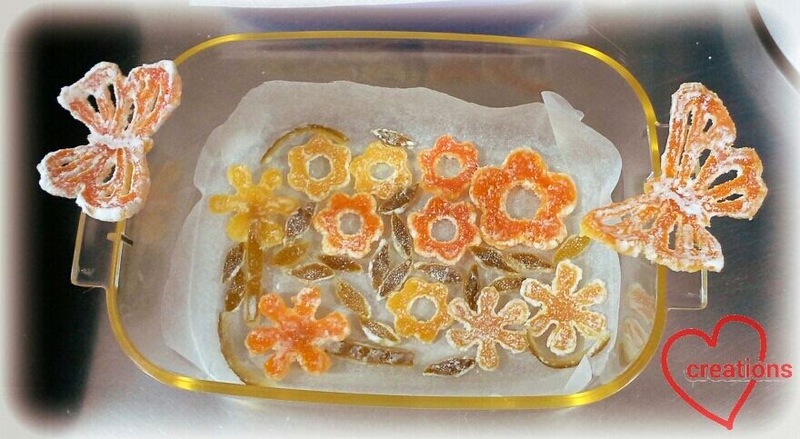 The candied peel was left over from my previous bake for my friend's party, which I will blog about soon. 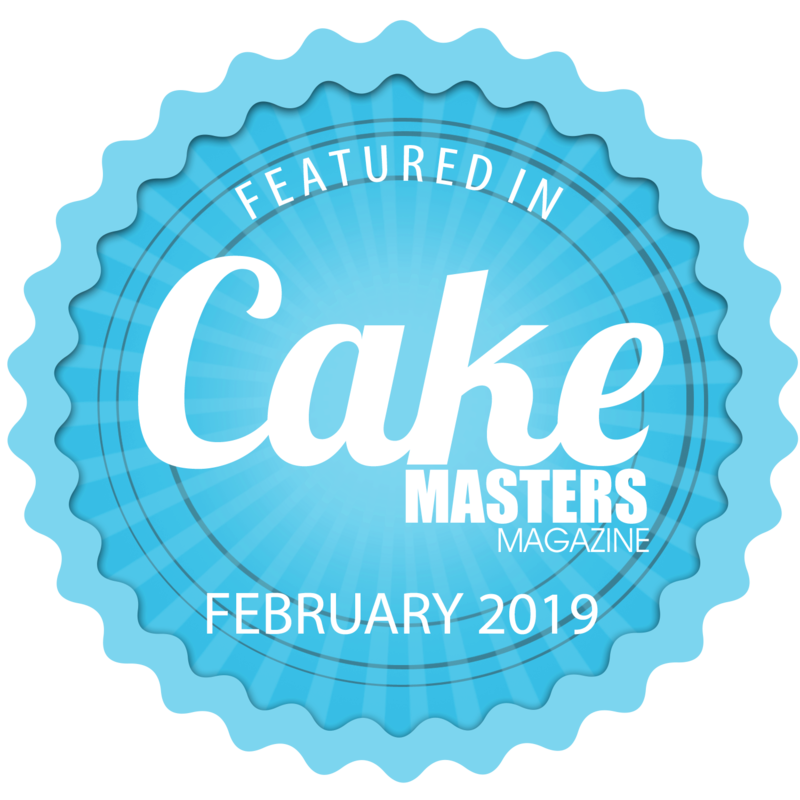 We enjoyed the lovely aroma and softness of this cake very much! The kids also recognize at once what I was trying to depict using the cakes because the assembly really looks like an empty tomb! May we find joy that we can be sure of our salvation because Jesus did rise from the dead, not only during this Easter season, but everyday of our lives :). I really love the soft, cottony texture of ogura cakes, so I absolutely had to try the pandan version! 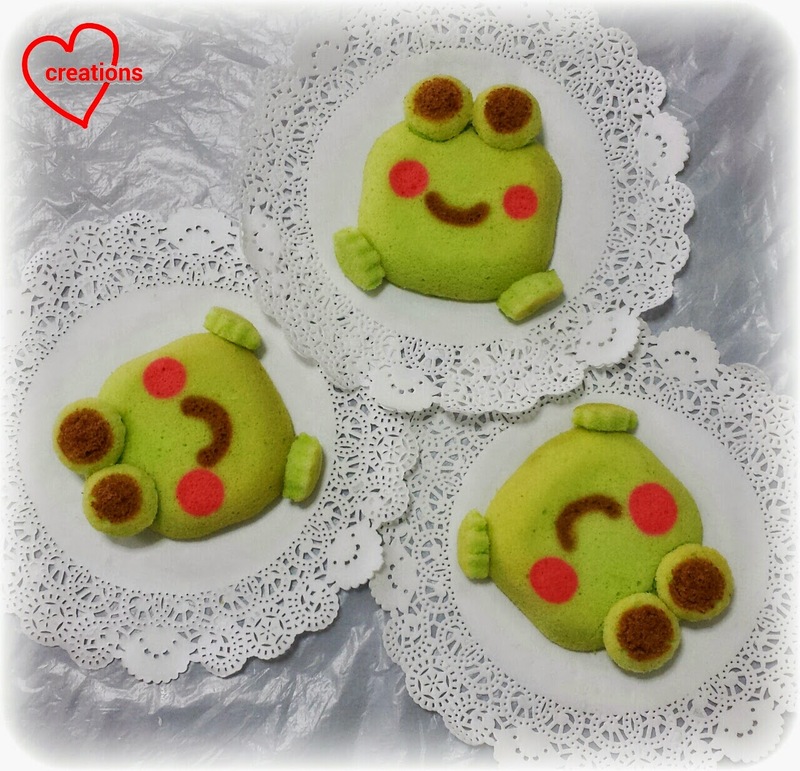 I was inspired to bake ogura froggies for my little kids and couldn't resist experimenting patterning with ogura batter. I adapted the recipe from Cooking Pleasure for pandan zebra ogura but halved the original recipe which was for a 9-inch tin. I pre-piped the eyes, mouth and cheeks and then baked the ogura cake over them. Don't the froggies look happy basking in the sun? :) Pandan ogura is really fragrant and melt-in-the-mouth! 2. Whisk egg yolks, whole egg, corn oil, coconut milk, pandan juice and salt until well combined. 4. Aliquot out 6 tsp of batter for patterning and divide batter 2:1 (brown: pink). Add 1 tsp of cocoa powder to the brown batter and a tiny dip of wilton pink coloring for the pink batter. Add 1/3 tsp cake flour to the batter and mix well. 5. Beat egg whites and cream of tartar until foamy using an electric whisk. Add in sugar in 2 additions and beat until firm peaks are formed (or just reach stiff peaks). The peak formed doesn't flop over but it's not overly stiff either. Scoop over meringue over into patterning batter (2 tbsp per tsp batter) and fold gently. 6. Fold in the rest of the meringue into the pandan batter gently in 2 additions. 7. Pipe the brown and pink batter onto the bowls and tray respectively (top panels in picture) and bake for 1.5 min. 8. Pour the pandan batter into the glass bowls and square tray till ½-2/3 full (middle panels). Bang the bowls/tray on the counter top 3 times each side to get rid of big air bubbles. 12. 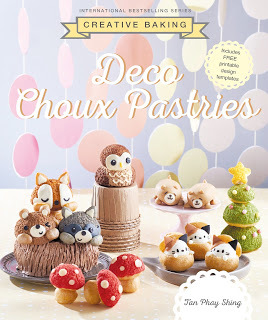 Carve out the the eyes and hands from the layer cake using a combination of cookie cutters and knife carving. “Glue” the parts onto the froggy cakes using melted white chocolate (bottom panels). Don't the froggies look happy basking in the sun? :) Pandan ogura is really fragrant and melt-in-the-mouth! I was thinking about this well known Bible verse as Good Friday approaches and wondered what meaningful bake I can do to remind the kids about God's love displayed through Jesus' death on the cross for our sins. Shops are stocking up on chocolate Easter eggs and bunnies as Easter approaches, and I thought it would be good to teach my kids from young that Easter is not about eggs and bunnies, but rather a time to be reminded of God's love and salvation for a fallen mankind. I decided on a simple bake as I just baked a cake for a friend's mini party yesterday (will blog about it soon) and didn't want to stress myself... a simple twist to the humble hot cross buns. I made them heart-shaped to represent God's love :). I also added red colored dried cranberries to symbolize Jesus' blood poured out for us. As I still have some whipping cream left over from my early grey salted caramel macaron bake, I decided to make the buns using Hokkaido milk bread as the bread base. 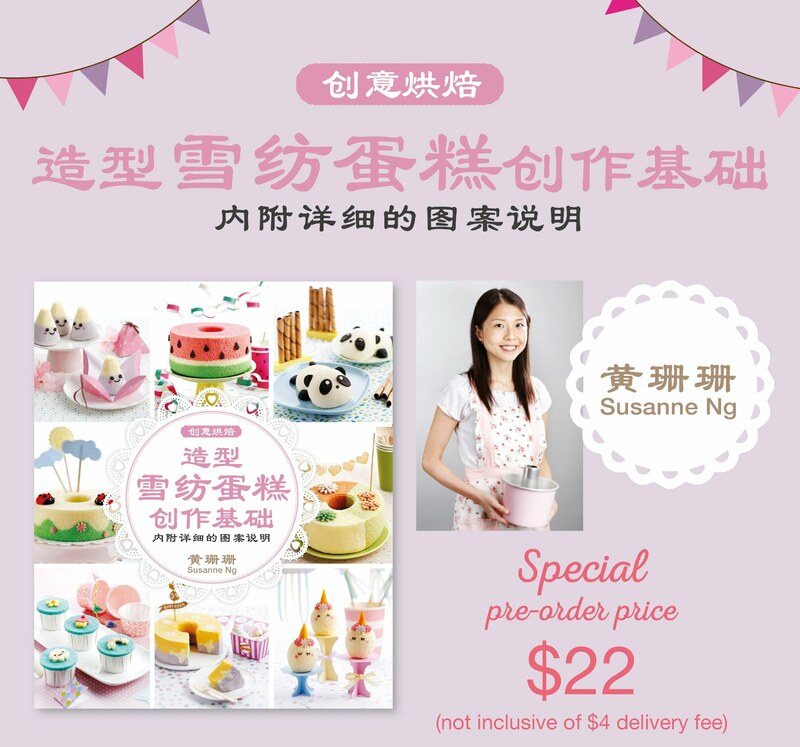 The recipe is adapted from Guai Shu Shu (for the Hokkaido milk bread base) and the April 2014 edition of the magazine GoodFood by BBC (for hot cross buns). You may find the quantity of some ingredients a little strange. That's because I was trying to finish the cream :P.
1. Combine all the dry ingredients (except for the cranberries) for the bread dough in a large bowl, adding in the salt only after everything else has been mixed thoroughly. Add in the wet ingredients (egg, milk and cream) and mix with a wooden spoon until a rough dough is formed. 2. Pour the dough onto lightly floured work surface or use a non-stick mat and hand knead the dough until it passes the windowpane test. About 15-20 minutes. Add flour a bit at a time if the dough is too sticky. You may use a breadmaker or standmixer to help you with the kneading. I personally prefer hand kneading as I can have a better feel of when the dough is ready. 3. Place the dough in a lightly greased bowl and cover loosely with cling wrap. Let it proof until doubled in size. Mine took about 45 minutes. 4. Punch down the dough and knead in the cranberries. 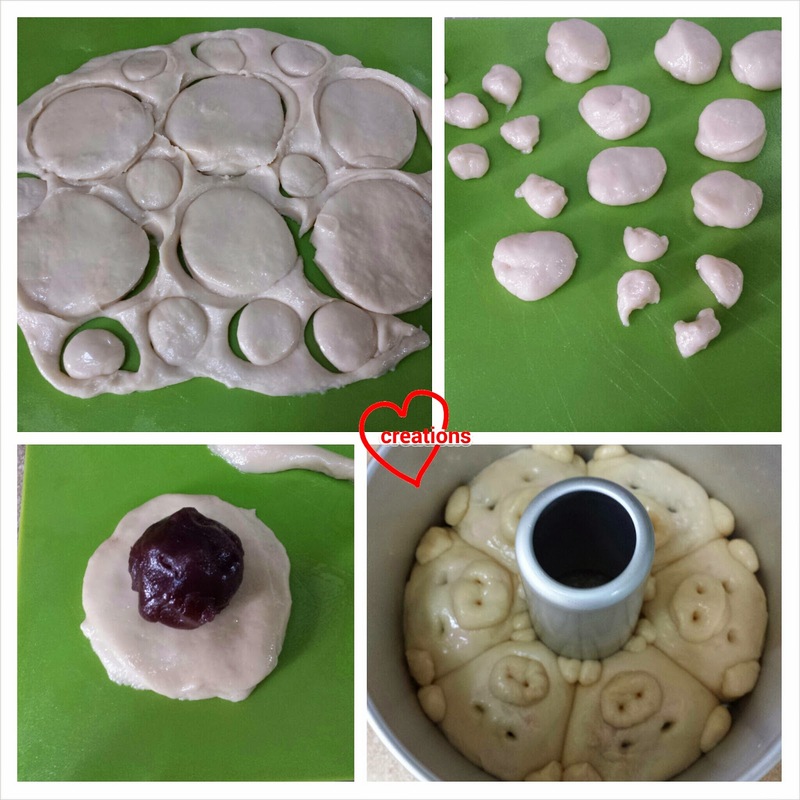 Divide the dough into 45-46g balls and shape them into heart shapes or use a silicone heart-shaped mould if you happen to have. If you don't have a mould, place the shaped buns onto a baking tray lined with baking sheet and cover loosely with cling wrap for the second proof, about 45 minutes-1 hour or doubled in size. 5. Towards the end of the second proof, preheat the oven to 190 degrees Celsius. Prepare the paste for piping the crosses on the buns. Mix the ingredients together to form a thick paste and place it in a piping bag fitted with a small round tip. I used Wilton #5 tip. Egg wash the buns with the leftover egg (18g of egg in the dough means there's definitely leftover egg) and pipe crosses on the buns. 6. Bake for 15 minutes and cool the buns on a cooling rack. 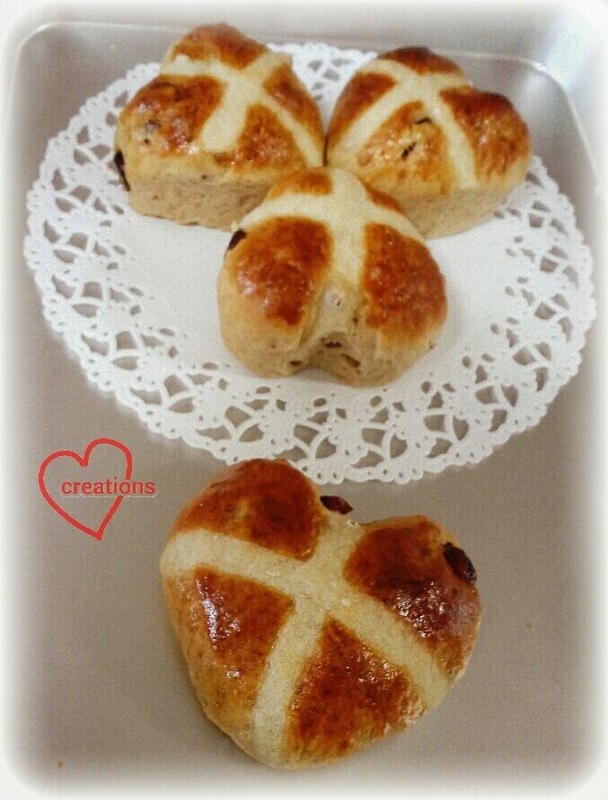 These buns are not as sweet as traditional hot cross buns so it would be good to eat them with jam if you have a sweet tooth. You may also choose to add apricot jam glaze instead of egg washing the buns if you don't intend to toast them again before eating. I gave away some freshly baked buns to my younger kid's busmate and little brother because the timing for picking the kids up was just right for enjoying fresh buns. 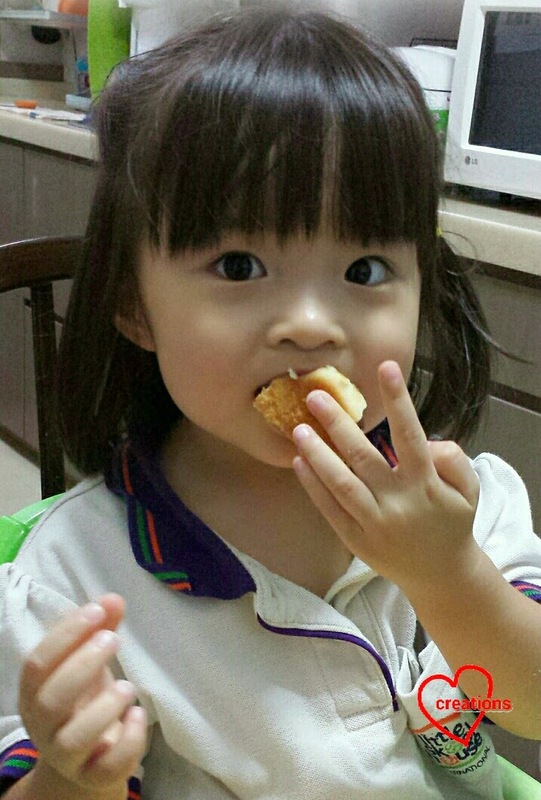 Our little friends enjoyed the buns without any jam and they loved it! My hubby and kids enjoyed the buns very much too :). Happy Easter to all! We were walking past a macaron shop in town and the kids reminded me that I "owe" them a macaron bake and hubby found the salted caramel macaron particularly attractive. I said it would be cheaper if I made them instead of buying from a shop that sells something which can be finished in a bite but costs a meal. And that was how this bake came about :). 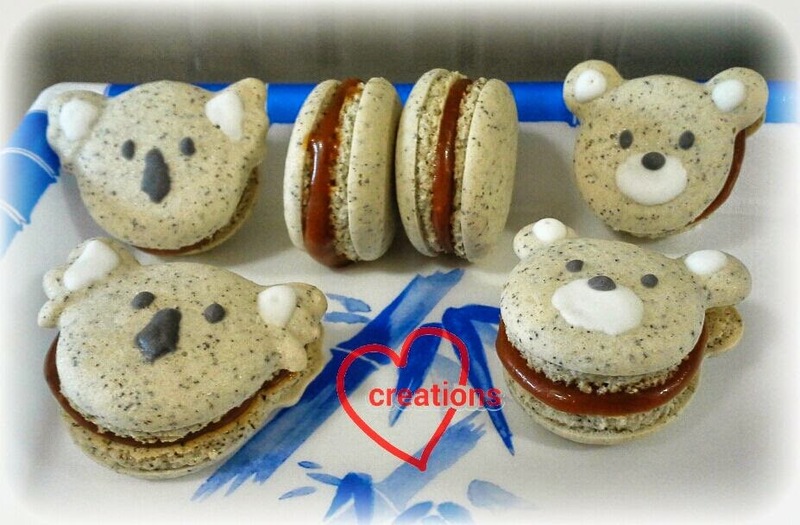 Can you believe that I made these earl grey salted caramel bears with a batter that has way too much water content? I will share how I averted a major disaster. I am just glad that they look decent and taste fine :)...although it would have been better if I got the batter right in the first place. 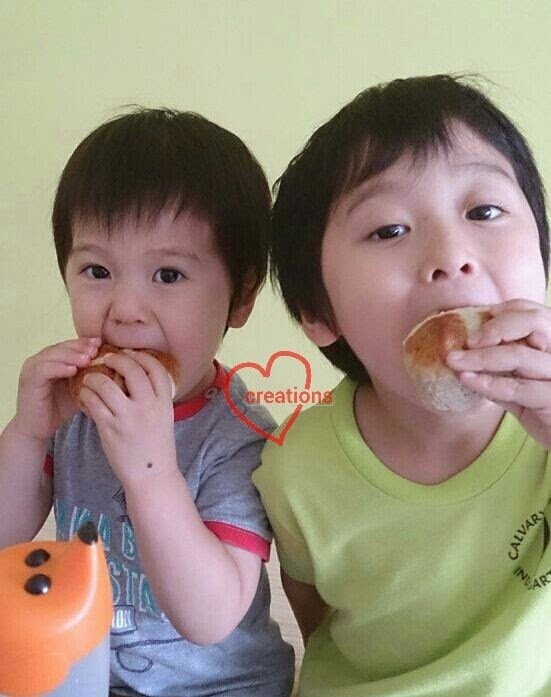 The little one said that he dreamed about macarons and requested for them after each meal! Hope he doesn't get caffeine overdose at a tender age of 4 :p. My elder kid and hubby loved it too so for this batch of macs we didn't give any of them away! I adapted the macaron shell recipe from my Matcha macarons. I used 3 tea bags of earl grey, discarding any bits that couldn't pass through a fine sieve. I also experimented with using slightly more water in the Italian meringue (79g, closer to the original recipe which used 80g that I adapted my Matcha macarons from) and half the amount of egg white powder (1/2 tsp). On hindsight those two moves were unwise on a rainy day in hot and humid Singapore! I suspect that I may have beaten the Italian meringue for too short a time (although I managed to get nice shiny and thick stiff peaks), resulting in a meringue with higher water content too. 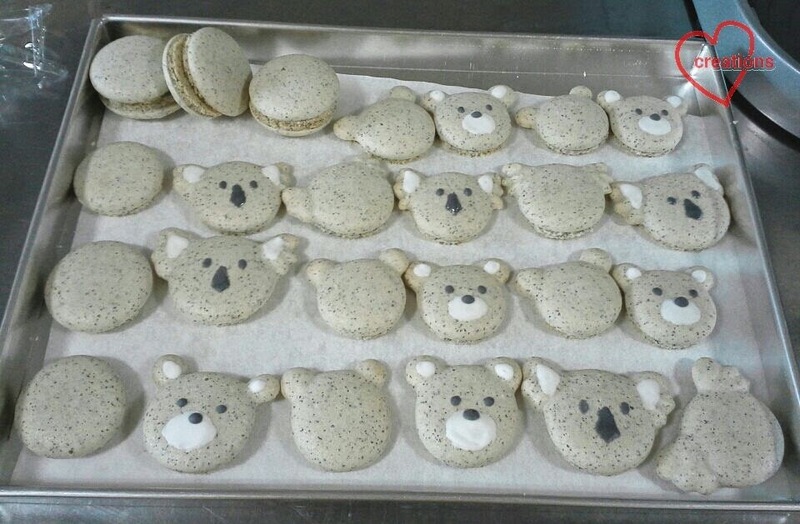 I piped round ones, teddy bear shaped ones and koala bear shaped ones. I also added a teeny bit of black food coloring to the mass to give the shells a greyer look. After drying my macs for 3 HOURS in an air conditioned room, the macs were still a sticky to touch but I went ahead and baked one tray of macs...and as expected, ALL of them had no feet but instead, have pock-marked surfaces. I decided to shut off the oven and experiment with drying the macs for as long as they need to completely dry out. That took an overnight drying time, a total of about 16 hours! Actually they could have dried earlier but I was in slumberland and couldn't have checked :p. So lesson to all newbies, it's absolutely important to have really dry shells before you bake them. Some patience will help to avert any major disaster. Imagine my joy at 6+am in the morning when I saw some feet and smooth surfaces on my macs after a whole tray of ugly macs the day before! The ugly macs still tasted fine, just not presentable. 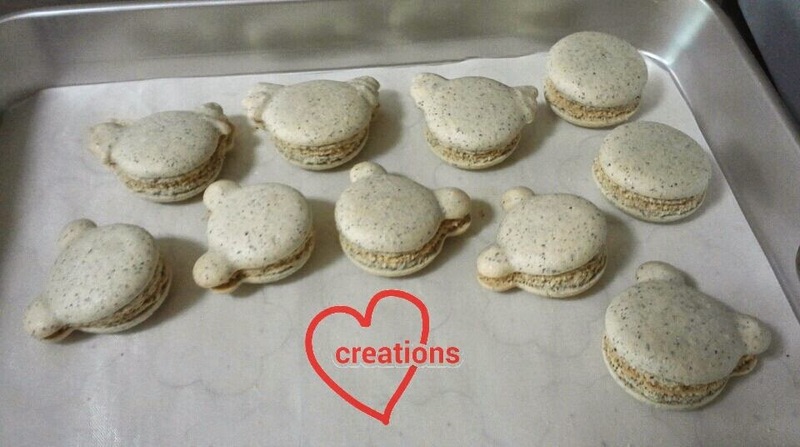 If you observe the macarons carefully, you will find that the portion with the ears have no feet or very small feet. 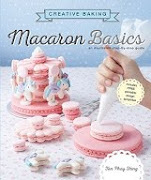 I did some search and found that the batter continues to be "folded" as you pipe the macarons. The more intricate the piping, the more folding the batter undergoes. This explains why the round macs have feet that are evenly sized and the bear shaped ones have uneven sized feet. Another thing I learn from this experience is to underfold the batter a bit during the macaronage stage if I plan to pipe macarons that are not round. 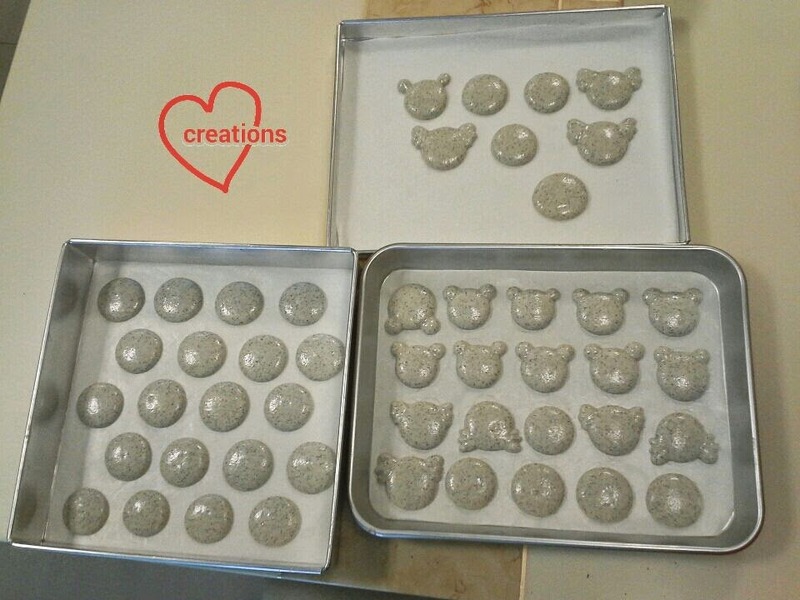 I prepared a small amount of royal icing sugar and painted the features on the bears' faces using a small food brush. I adapted the salted caramel recipe from here. 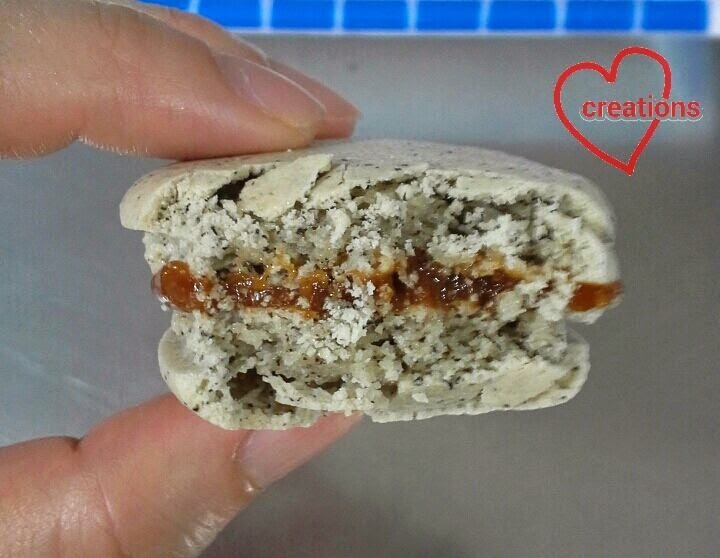 I added more salt and infused the cream with a bag of earl grey to give the macarons a stronger tea flavor. 1. Heat cream in a small sauce pan and let the tea bag steep in it until the cream turns tan-colored. discard the tea bag. Set aside the cream. 2. Heat caster sugar and water in a small heavy based saucepan over low fire to dissolve the sugar. Bring to boil and cook until syrup turns amber color as it caramelizes. 3. Remove from heat and add light brown sugar, butter and cream. Stir to dissolve the sugar then return to the stove and simmer at low heat for 3-4 minutes until caramel thickens and coats the back of the spoon. 4. Remove from heat, add salt and stir until it dissolves. 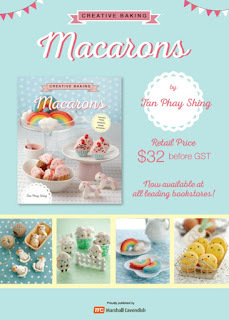 Pour into a bowl and leave it to cool and thicken before spooning or piping the caramel onto the macaron shells. Leave the filled macarons in the fridge overnight in an airtight container. They taste better the next day. Let the macarons warm up to room temperature for about 15 minutes before consuming or the caramel will be too hard to bite. Here's how it looks like when you take a bite! Please excuse the poor photography. 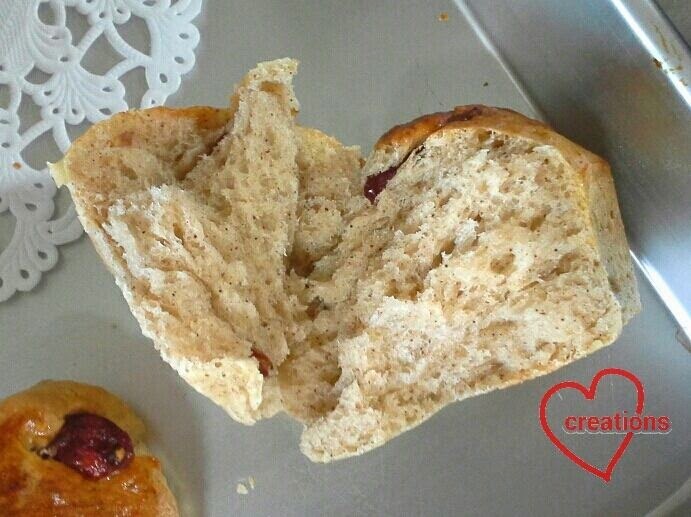 I am always in a rush when I take the photos, what with being a busy mum :P.
I am always on a quest to look for good recipes to make soft and fluffy bread and I think I found one from The Baking Bee with the Breadtalk pork floss bun recipe. I copied the recipe with some minor changes since I don't have milk powder at home. I also reduced the amount of sugar as I prefer bakes that are less sweet. 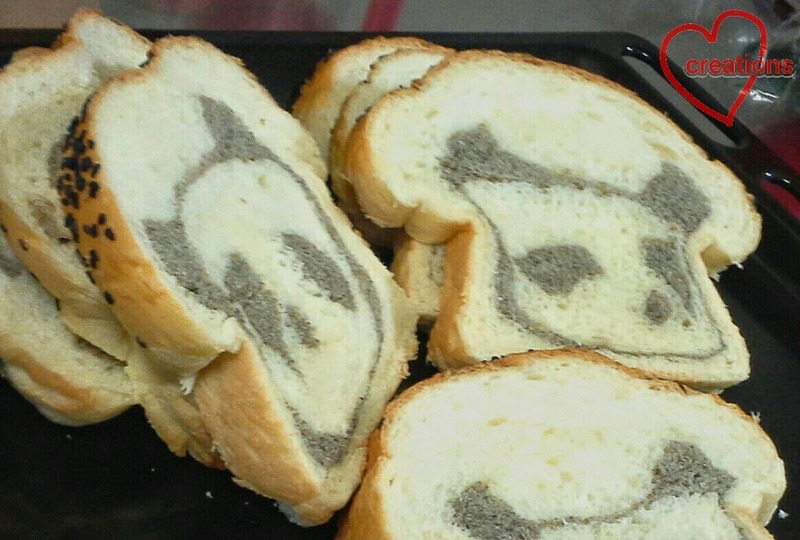 Instead of a plain loaf, I decided to have some fun and hide a panda face in it ;). See the panda staring at you from every slice! The bread remains very soft even after storing at room temperature for 2 days! This is quite a feat since we don't add bread improver for home baking. I decided to flavor a portion of the dough with store bought black sesame powder to create the panda face. 1. Mix yeast with water and let it rest for 10 minutes. 2. Mix the above with the rest of the ingredients in a large bowl to form a dough. 3. Cover with cling wrap and let it rest at room temperature (in Singapore it's anywhere from 25-30 degrees Celsius) for 2 and 1/2 hours. 1. Add sugar, salt and eggs to the sponge dough. 2. Mix in the flour, yeast and milk and knead until well combined. You may use the bread maker or hand knead. If you are hand kneading, you may need to throw the dough on your work surface and use a bench scraper as the dough is very sticky. I hand kneaded this and it took me about 5 minutes. 3. Add in the butter and knead to form an elastic dough. I hand kneaded the dough for about 20 minutes after the butter was added, in order for the dough to pass the windowpane test. If you are using a bread maker, use the dough function, follow the above sequence of adding ingredients and let the machine knead to form an elastic dough. 4. Weigh out 85g of dough and knead 15g of black sesame powder* into it while keeping the rest of the dough covered with cling wrap. Add plain flour to the dough while incorporating the black sesame powder bit by bit if it gets too sticky to handle and shape. Try to work quickly as the yeast will continue to work through the dough while you are shaping. 7. Line a loaf pan with baking sheet and place the assembled dough in it. Cover loosely with cling wrap and let it proof for 45 minutes. 8. Brush with egg wash and scatter some black sesame seeds on top. 9. Bake at 170 degrees Celsius for 30-35 minutes. 10. Cool completely on a wire rack before slicing the loaf. 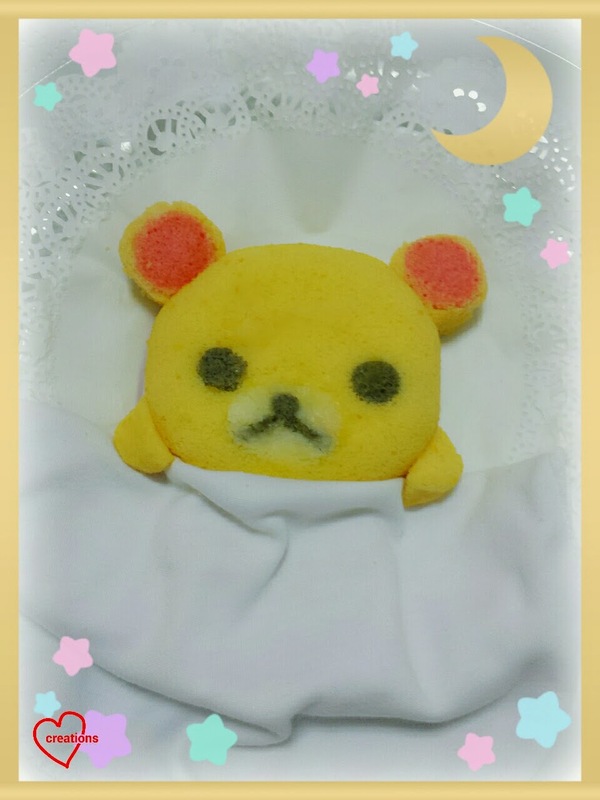 Look at how soft and fluffy the bread is! * I bought the black sesame powder from Cold Storage which already has sugar added. Alternatively, you can make your own black sesame powder by toasting black sesame seeds in a toaster oven or frying pan, grinding it in a food processor or by using mortar and pestle, and then sifting the ground sesame.